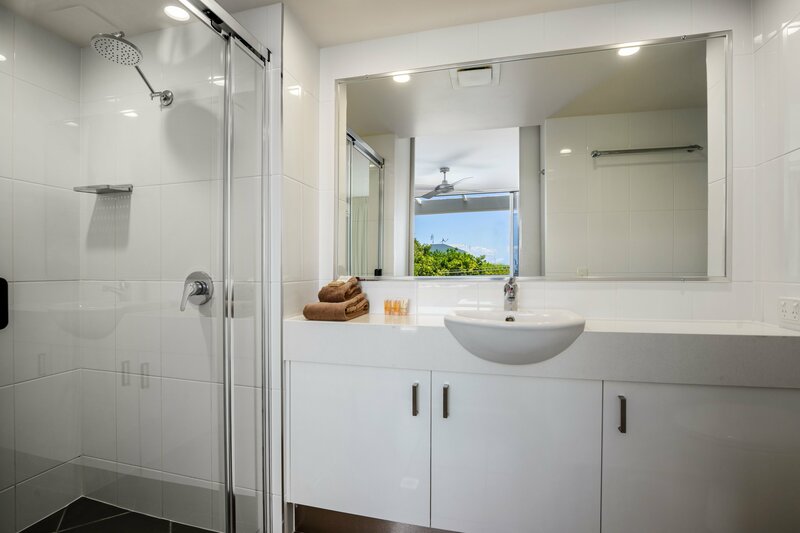 Sundancer... relax and enjoy the sweeping panoramic views of Queensland's beautiful Sunshine Coast, Sunshine Beach and Noosa's surf coast. Our Resort is Ideally suited to couples and small families requiring relaxing and quiet accommodation. 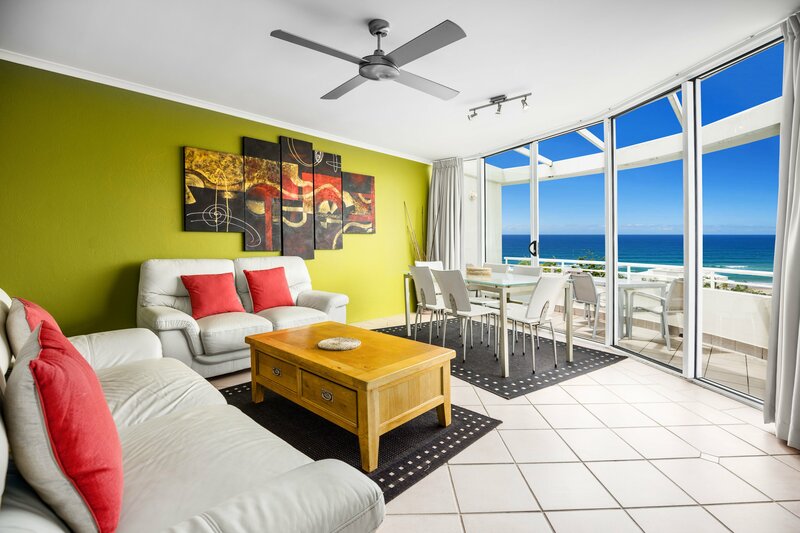 14 Spacious and Private Holiday Apartments with Ocean Views. Fully Self-Contained and Self-catering. Free Unlimited Wi-Fi and Foxtel TV. Heated saltwater pool. 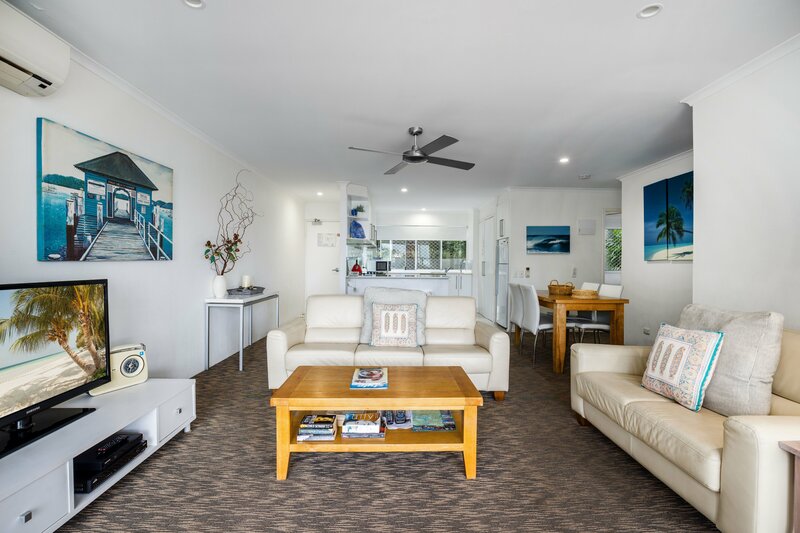 Perfectly located at Sunshine Beach and just 30 minutes from the Maroochydore Airport and 1 1/2 Hours from Brisbane Airport. 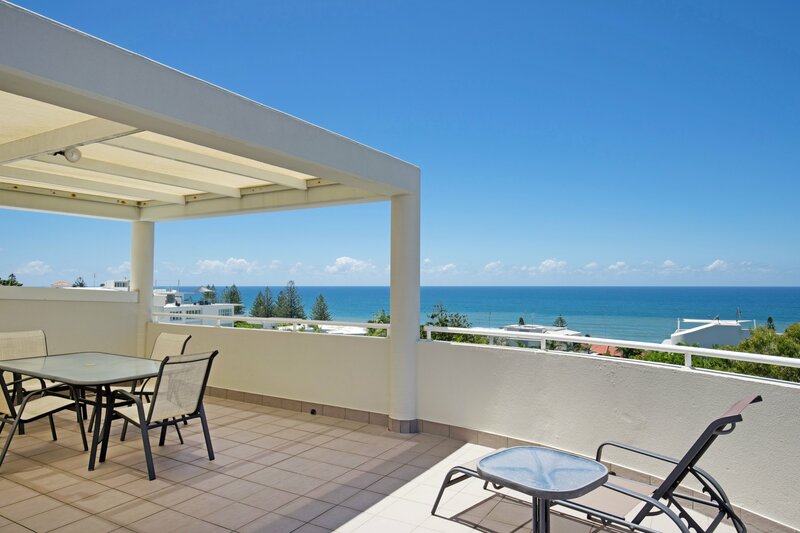 Sundancer Holiday Apartments offer comfortable and spacious beach living all with Ocean Views. Quiet and peaceful surroundings. 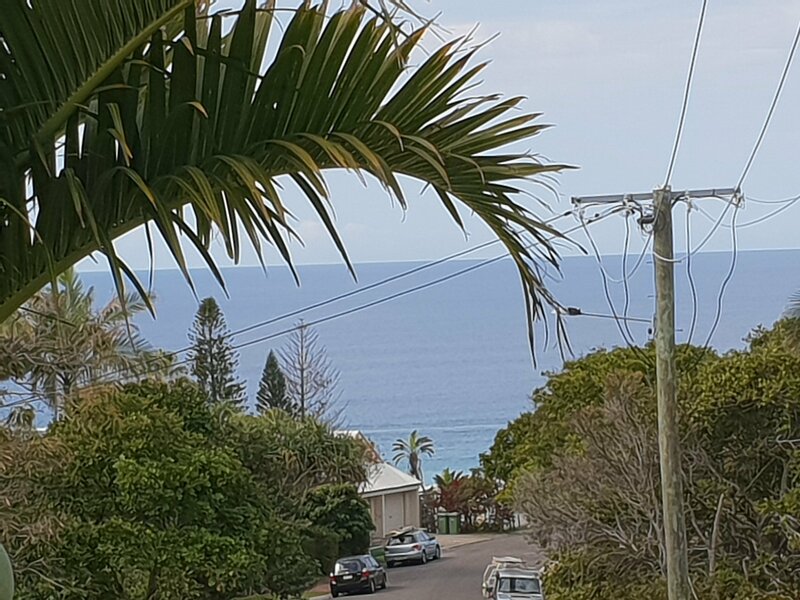 Quaint Shopping Village under 1 minute stroll from our front door and under 2 minutes walk to Sunshine Beach one of Australia's premier patrolled ocean beaches. 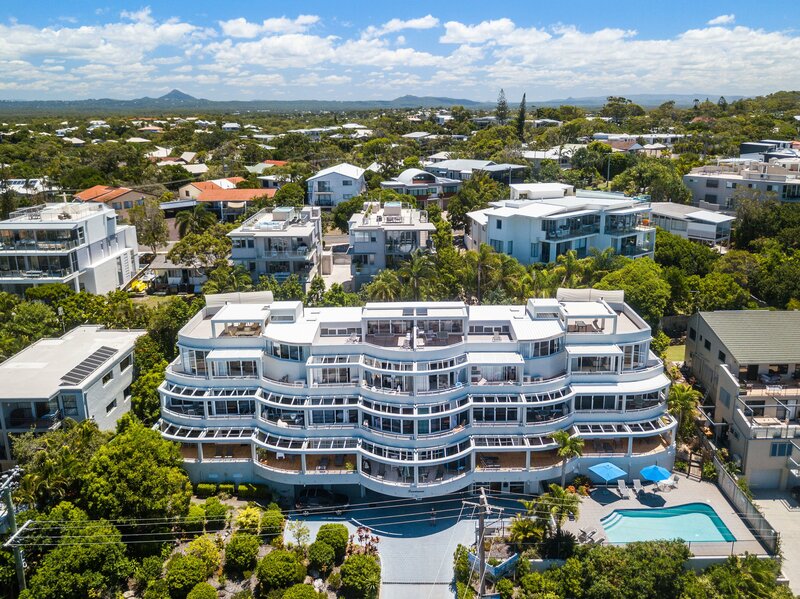 We are only minutes drive from the exciting atmosphere that has made Noosa's Hastings Street famous. 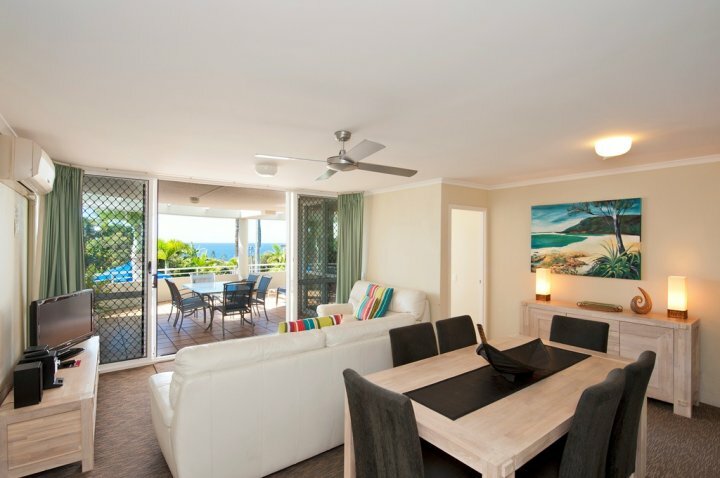 Sundancer at Sunshine Beach will complete the ideal setting for your holiday destination. 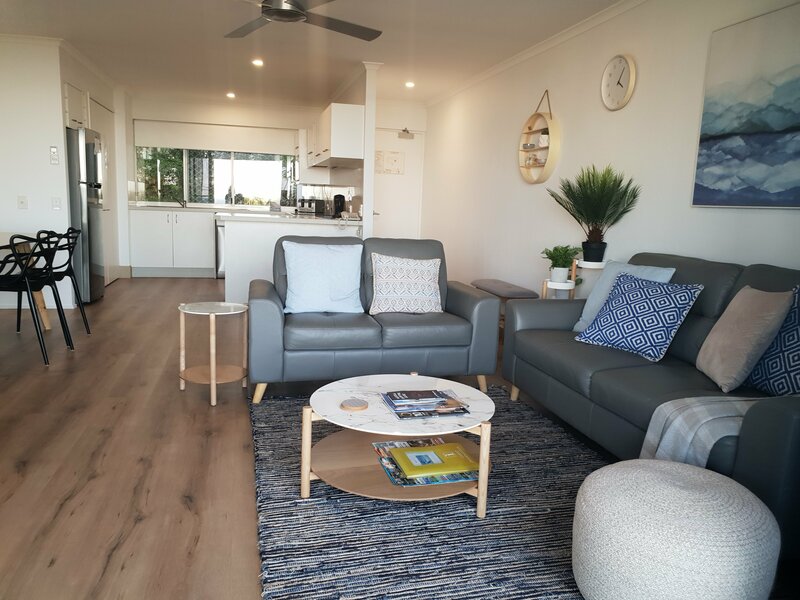 Level One - Beautifully presented apartment. Full glass sliding doors open onto a large private east facing balcony with Garden Views from living room and main bedroom. Main bedroom Deluxe King bed with en-suite and "Flat Screen TV. 2nd Bedroom 2 x Single Beds. 2 Bathrooms. Living Area Flat Screen TV & DVD player. Cream Leather Lounge suites and Oak wood furnishings. Foxtel TV. FREE Unlimited WI-FI. Direct dial telephone, Full linen provided. Reverse cycle air co. Ceiling Fans throughout. Outdoor Setting including sun lounges. NO Smoking Inside. Note - NO LIFT. No Parties. No Functions. Max.4 Guests. 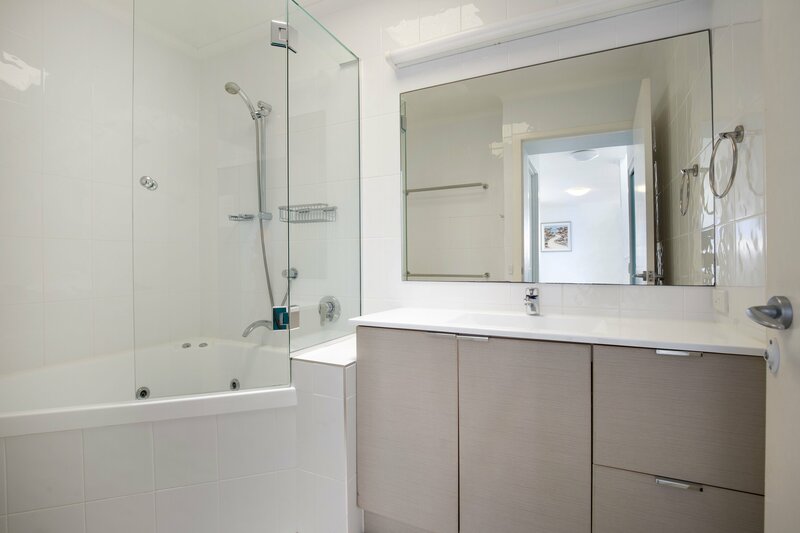 LLevel One - Beautifully presented apartment. Full glass sliding doors open onto a large private east facing balcony with Garden Views from living room and main bedroom. Main bedroom Deluxe King bed with en-suite and Flat Screen TV. Living Area Flat Screen TV & DVD player. Cream Leather Lounge suites and Oak wood furnishings. Foxtel TV. FREE WI-FI. Direct dial telephone, Full linen provided. 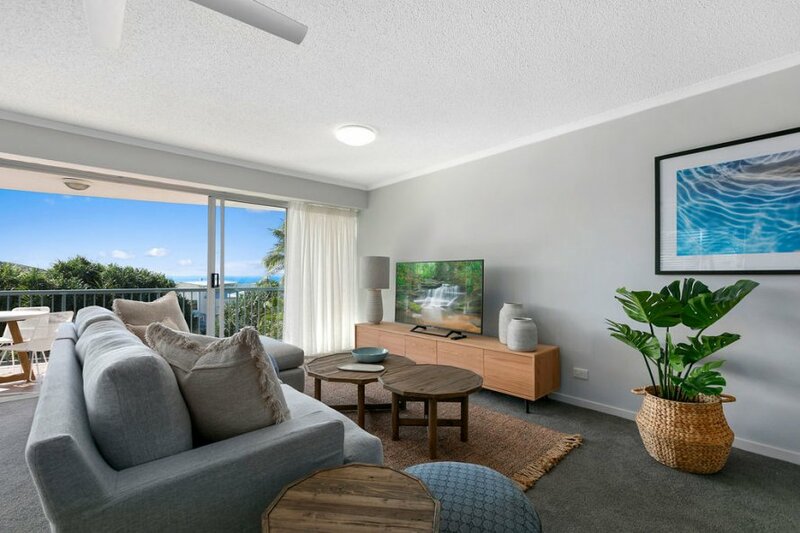 Reverse cycle air con in Living area and Master Bedroom. Ceiling Fans throughout. Outdoor Setting including sun lounges. No Smoking Inside. Note - NO LIFT. No Parties. No Functions. Max.2 Guests. 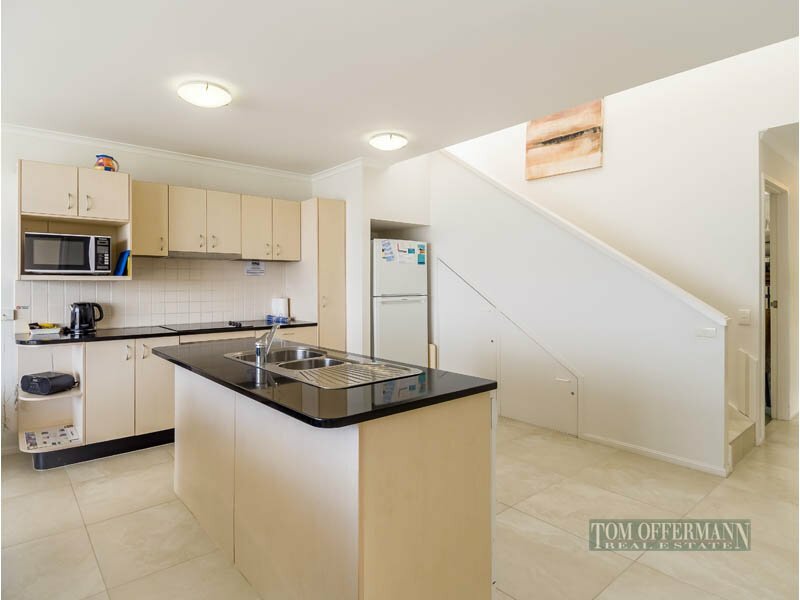 Level One - Beautifully presented apartment. Full glass sliding doors open onto a large private east facing balcony with Garden Views from living room and main bedroom. Main bedroom Deluxe King bed with en-suite and Flat Screen TV. Living Area Flat Screen TV & DVD player. Cream Leather Lounge suites and Oak wood furnishings. Foxtel TV. FREE WI-FI. Direct dial telephone, Full linen provided. 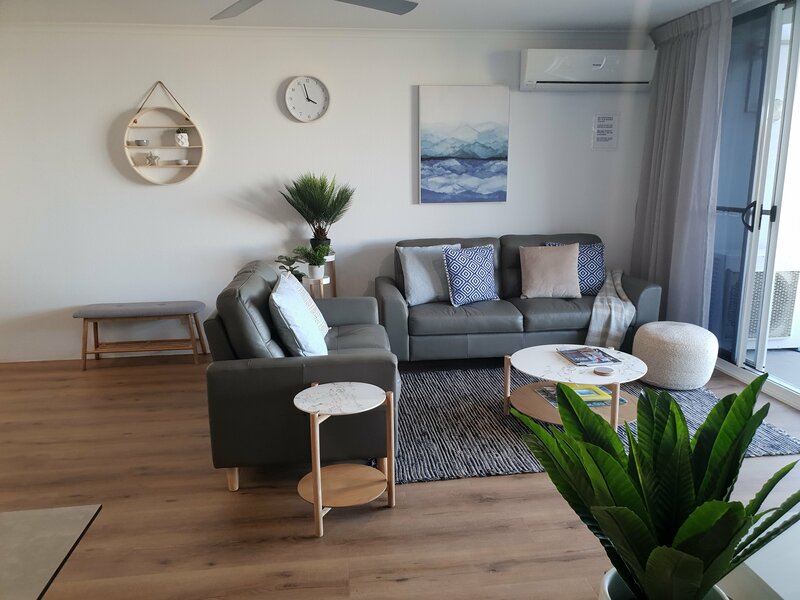 Reverse cycle air con in Living area and Master Bedroom. Ceiling Fans throughout. Outdoor Setting including sun lounges. No Smoking Inside. Note - NO LIFT. No Parties. No Functions. Max.2 Guests. 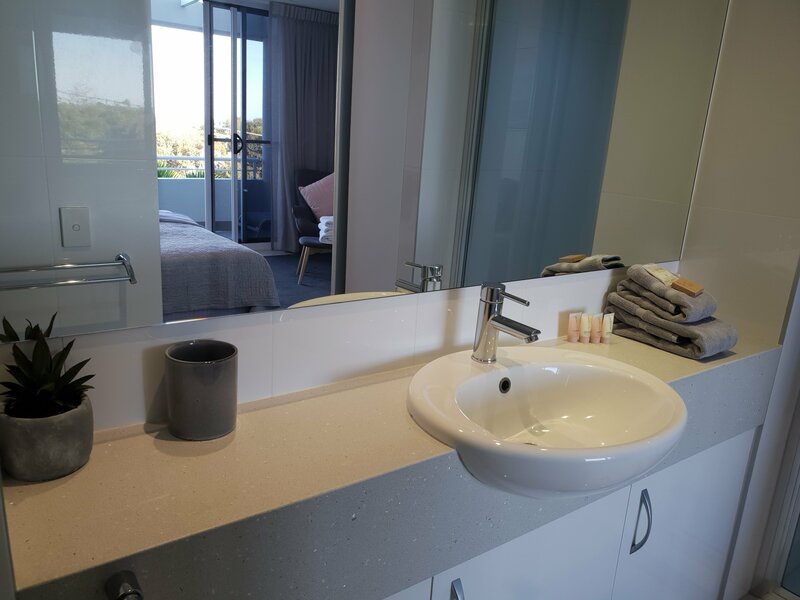 Level One - Beautifully presented apartment. Full glass sliding doors open onto a large private east facing balcony with Garden Views from living room and main bedroom. Main bedroom Deluxe King bed with en-suite and Flat Screen TV. Second Bedroom garden view, 2 Single beds and adjoining 2nd Bathroom and separate toilet. Living Area Flat Screen TV & DVD player. New Cream Leather Lounge suites and New Oak wood furnishings. Free Foxtel TV. FREE WI-FI. Direct dial telephone, Full linen provided. Air Conditioned every room. Ceiling Fans throughout. Outdoor Setting including sun lounges. No Smoking Inside. Note - NO LIFT. No Parties. No Functions. Max.4 Guests. 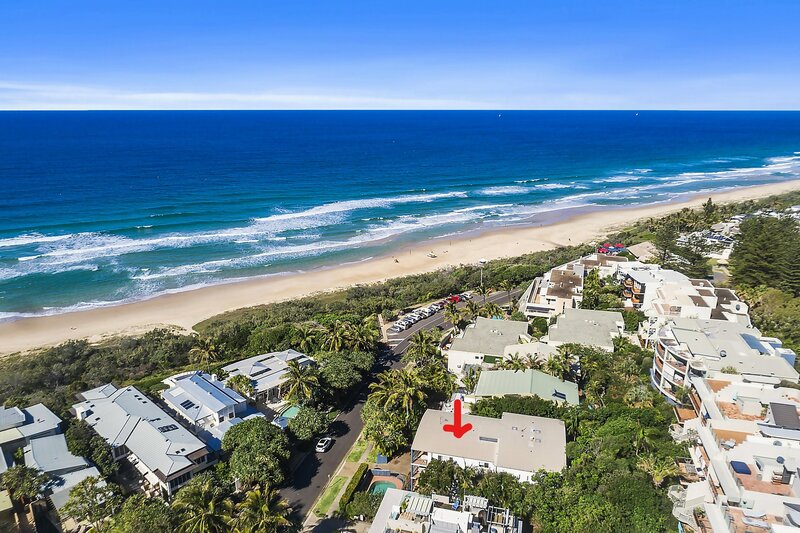 Located at Sunshine Beach with Beach front access across the road to Sunshine Beach! 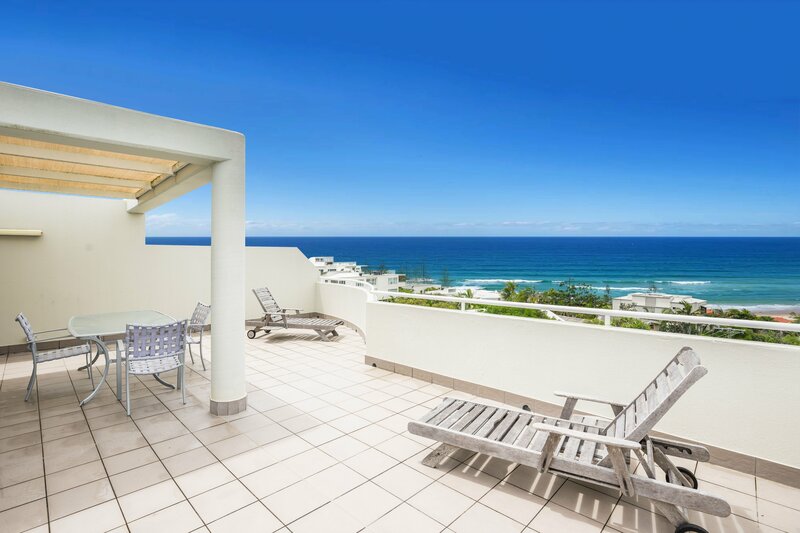 Ocean Views from this luxurious apartment on Belmore Terrace adjacent Surf Club and stroll to Sunshine Beach Village. Newly refurbished spacious and modern. Small complex of 5 Apartments. 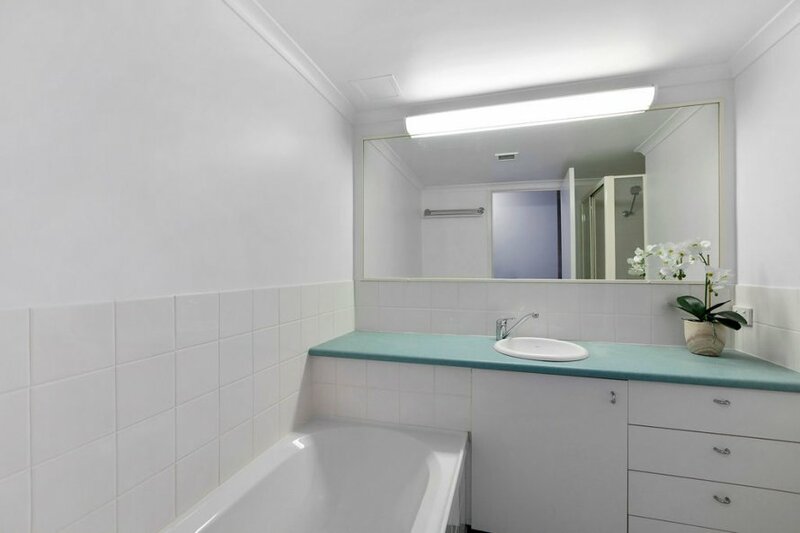 One bedroom with bathroom. King Bedroom or option to have 2 x Single beds (Note no air conditioning in the single bedroom option). 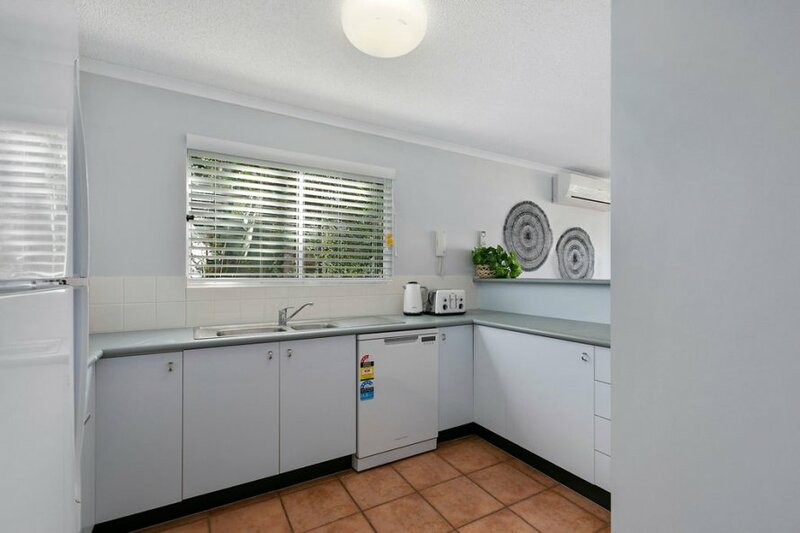 Full kitchen and Laundry facilities. Ample kitchen equipment. Full linen provided. Free Wi-Fi access. TV/DVD Player. Ceiling Fans throughout. 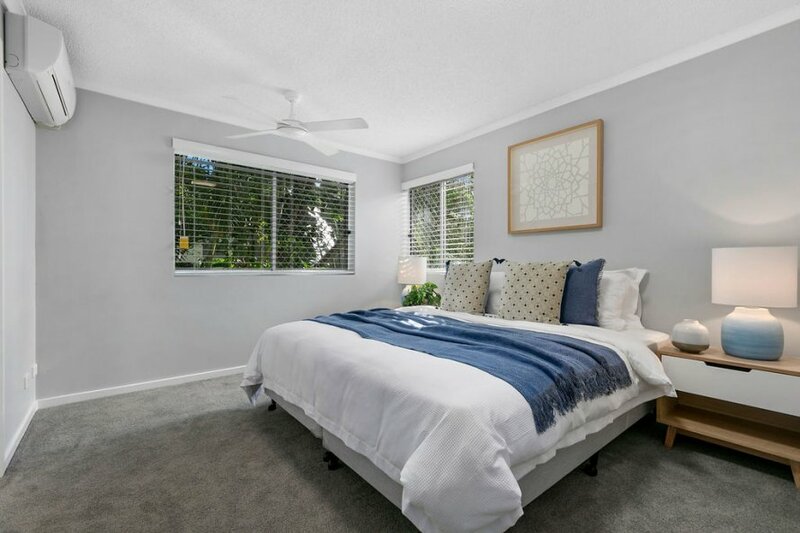 Air Con reverse cycle in living room and Master King bedroom only. LIFT ACCESS. Secure Single garage. 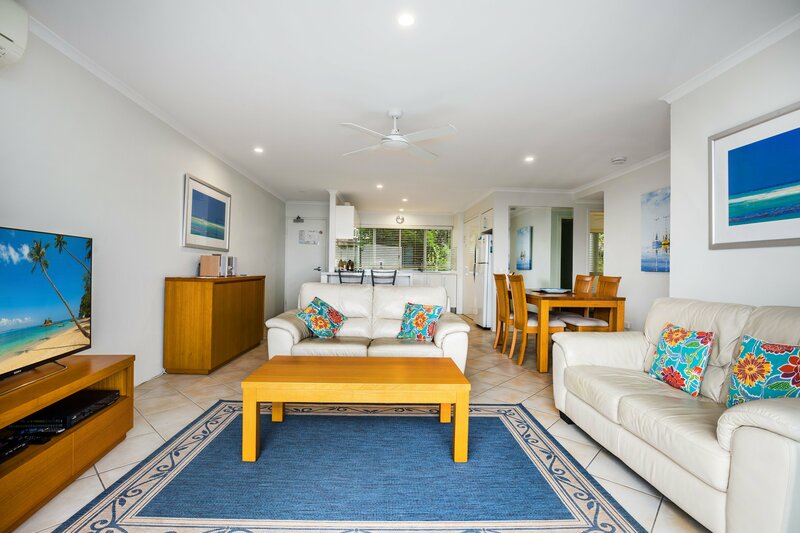 Located at Sunshine Beach with Beach front access across the road to Sunshine Beach! 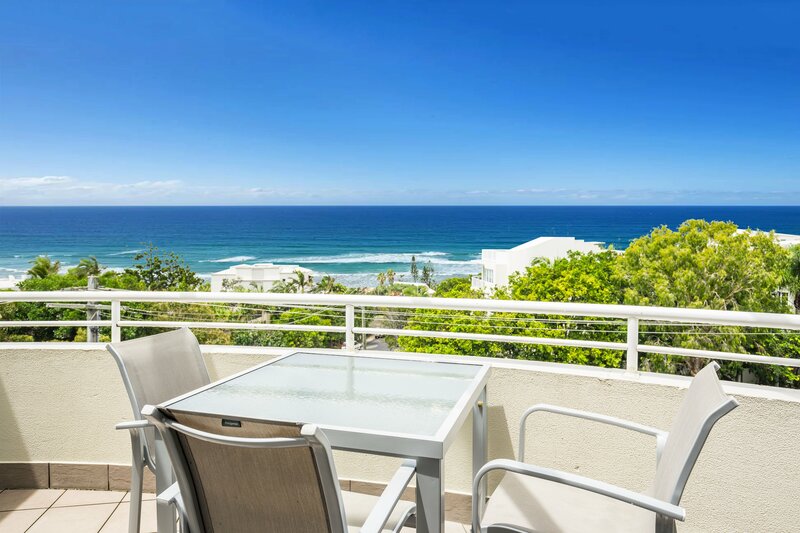 Ocean Views from this luxurious apartment on Belmore Terrace adjacent Surf Club and stroll to Sunshine Beach Village. 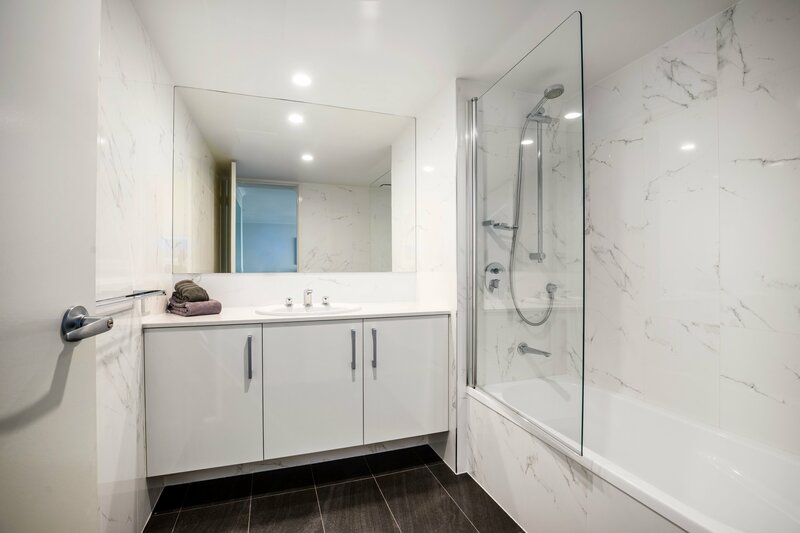 Newly refurbished spacious and modern. Small complex of 5 Apartments. Two bedroom s and two bathrooms. 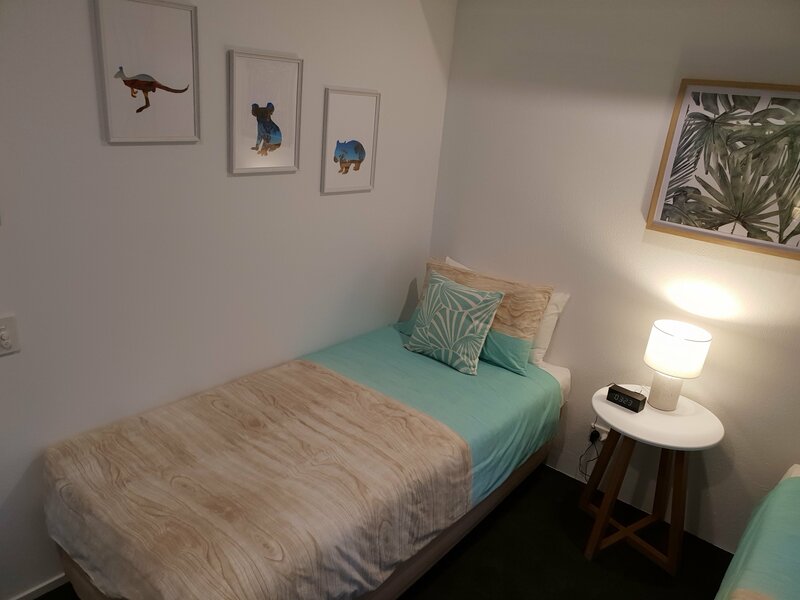 1 King Bedroom and 2nd Bedroom 2 Single beds with option to convert to King (Fee applies $35). 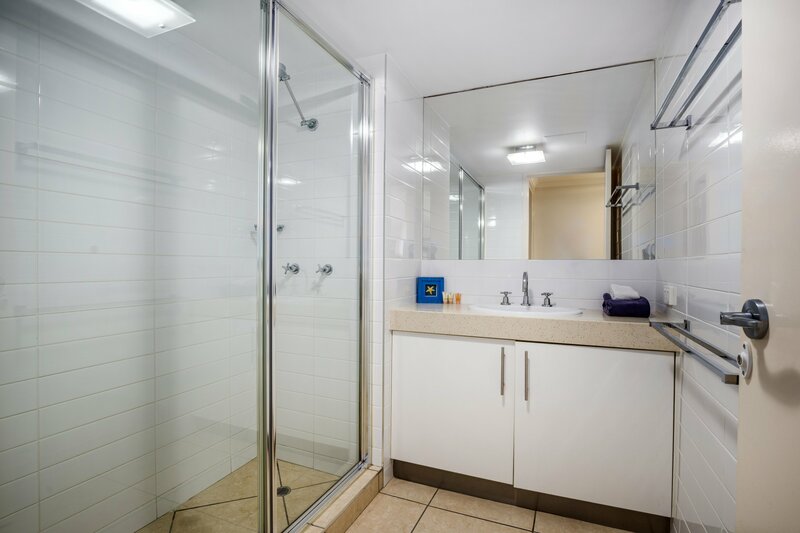 Full kitchen and Laundry facilities. Ample kitchen equipment. Full linen provided. Free Wi-Fi access. TV/DVD Player. Ceiling Fans throughout. 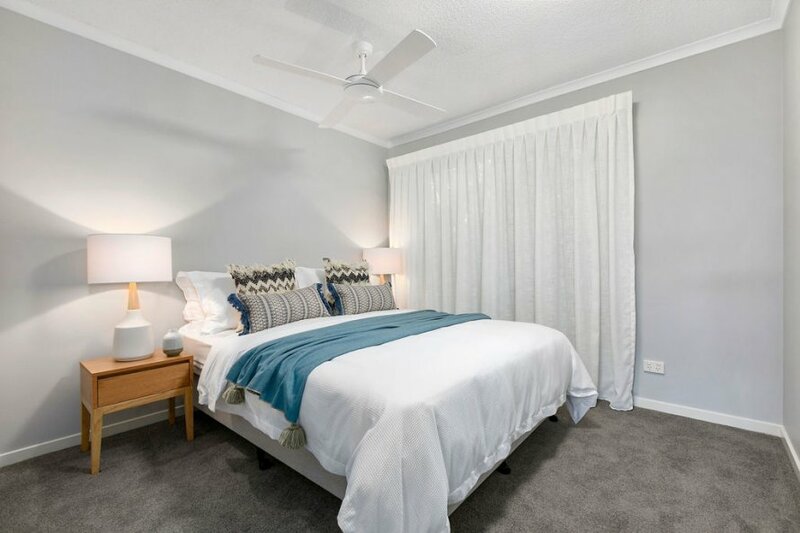 Air Con reverse cycle in living room and Master bedroom. LIFT ACCESS. Secure Single garage. 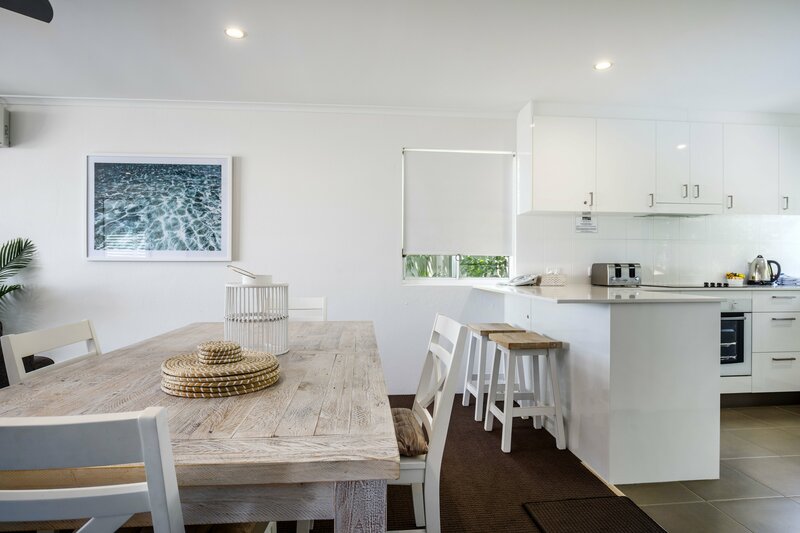 Located at Sunshine Beach with Beach front access across the road to Sunshine Beach! 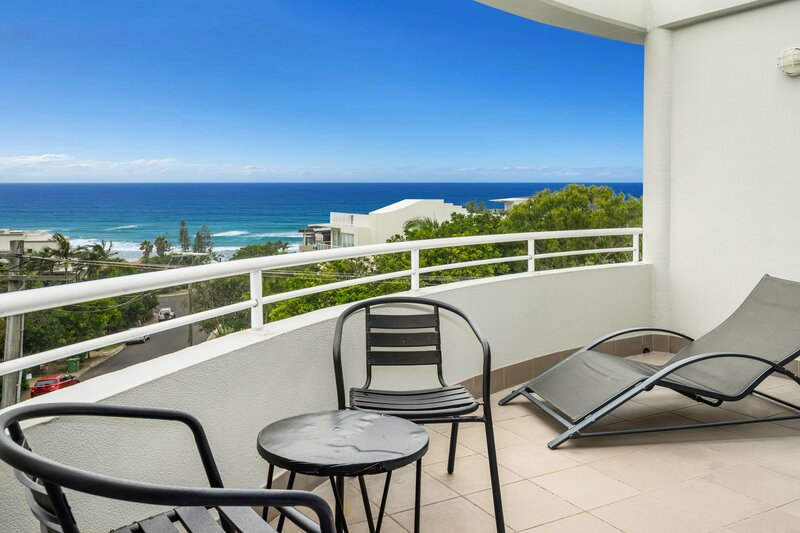 Ocean Views from this luxurious apartment on Belmore Terrace adjacent Surf Club and stroll to Sunshine Beach Village. Newly refurbished spacious and modern. Small complex of 5 Apartments. Three bedrooms and two bathrooms. 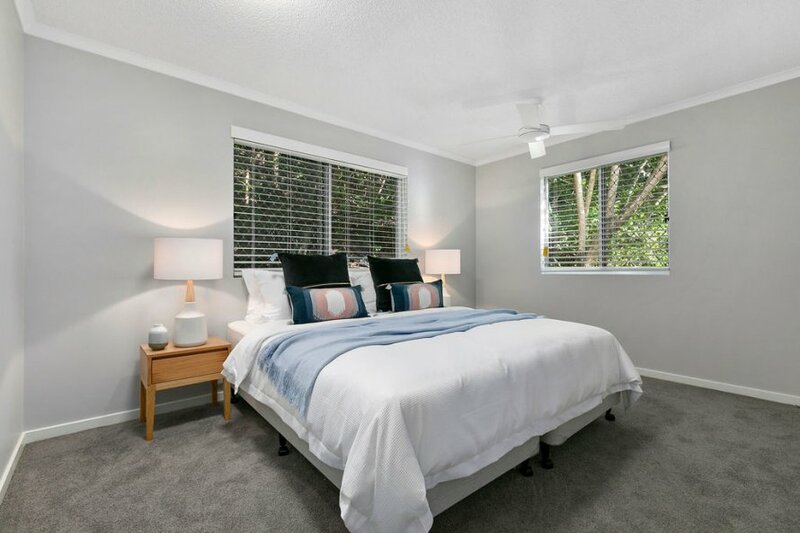 1 King Bedroom, 1 Queen Bedroom and 2 x Singles with option to convert to a King (fee applies $35). 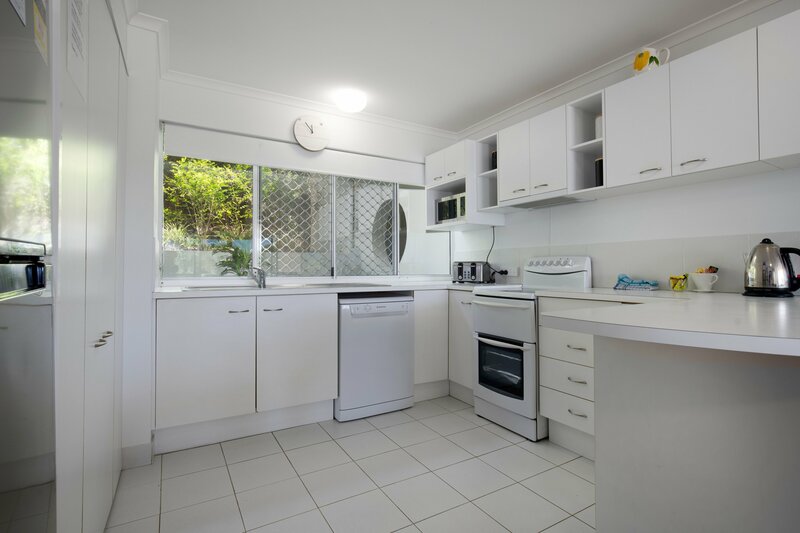 Full kitchen and Laundry facilities. Ample kitchen equipment. Full linen provided. Free Wi-Fi access. TV/DVD Player. Ceiling Fans throughout. 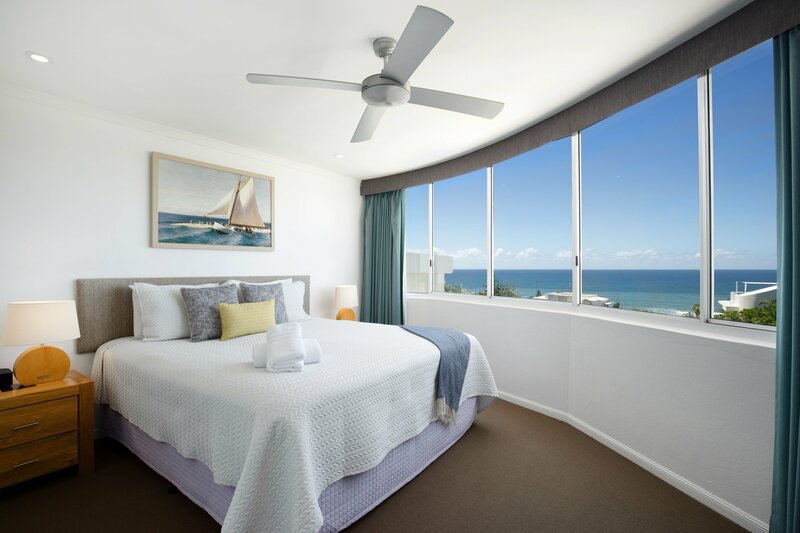 Air Con reverse cycle in living room and Master bedroom. LIFT ACCESS. Secure Single garage. 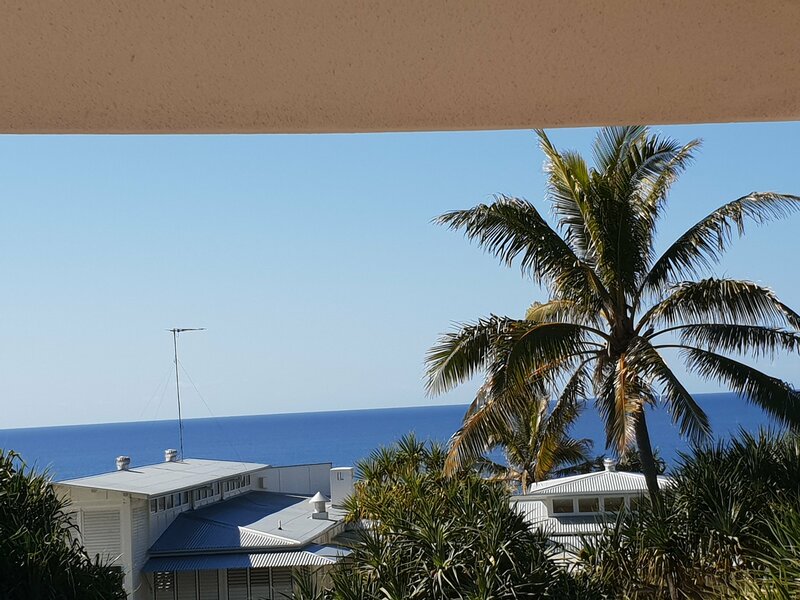 Level One Ocean View over the Pool - Full glass sliding doors open onto extra large private east facing balcony from living room and Main bedroom. Main bedroom Ultra Super King bed with en-suite, 2nd Bedroom 2 x Single Beds. 2 Bathrooms. Flat Screen smart TV, DVD player, Free Foxtel TV. Free Unlimited WI-FI. Direct dial telephone, Full linen provided. Reverse cycle air conditioning in living room and Master Bedroom only and ceiling fans throughout. Outdoor Setting including sun lounges. Important Notes Older Style bathrooms and kitchen - Smoking Inside. Note - Walk up access only NO LIFT. No Parties. No Functions. Max. 2 Guests. Apartment 4 modern Living/Dining Furniture in Light Wood Grain. Ultra Super King Bed and 2 x Flat Screen TV's. 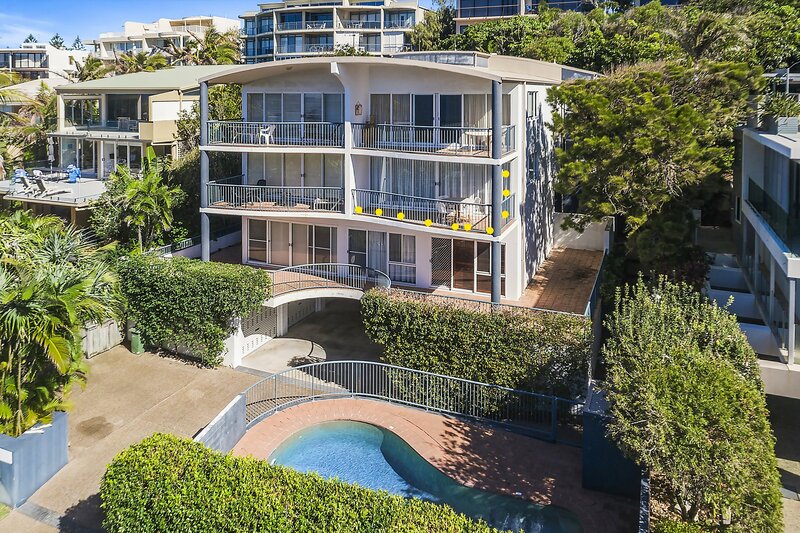 Situated over the Pool with Great Ocean Views. Star Rating 3 1/2 Star Apartment. Special Note for Star Ratings Please note we do not decrease the Tariff for our 3 1/2 Star Apartments as they are very well maintained and beautifully presented. 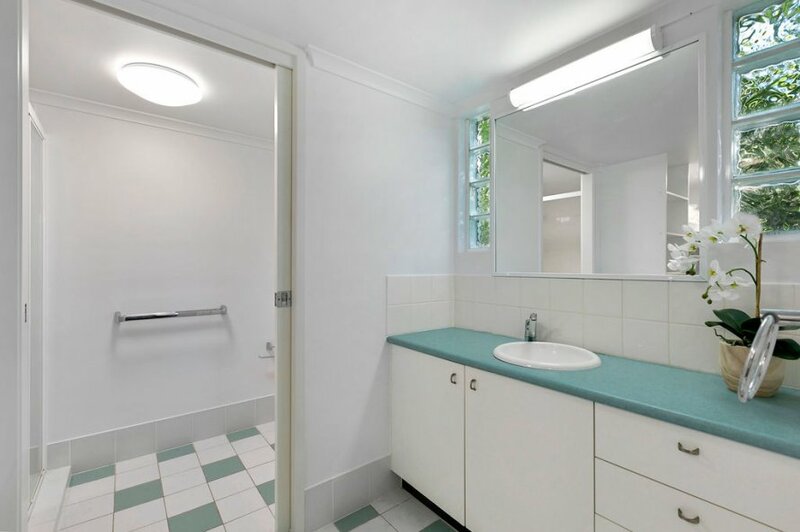 The bathrooms and the kitchen are well presented and are the older style. Level One - Full glass sliding doors open onto extra large private east facing balcony to capture views from living room and Main bedroom. Master bedroom Ultra Super King Bed with en-suite, Flat Screen smart TV, DVD player, Foxtel TV. FREE WI-FI. Direct dial telephone, Full linen provided. Reverse cycle air conditioning and ceiling fans throughout. 4 Seat Outdoor Setting including sun lounges. The bathrooms and the kitchen older style. No Smoking Inside. Note - NO LIFT. No Parties. No Functions. Max. 2 Guests. EXTRA GUESTS Extra Child Permitted Only up to 2 Years Old $40 per night charged. Port-a-cot available on request only.. Apartment 4 has modern Living/Dining Furniture in Light Wood Grain. Ultra Super King bed in master Master bedroom.and 2 x Flat Screen TV's. 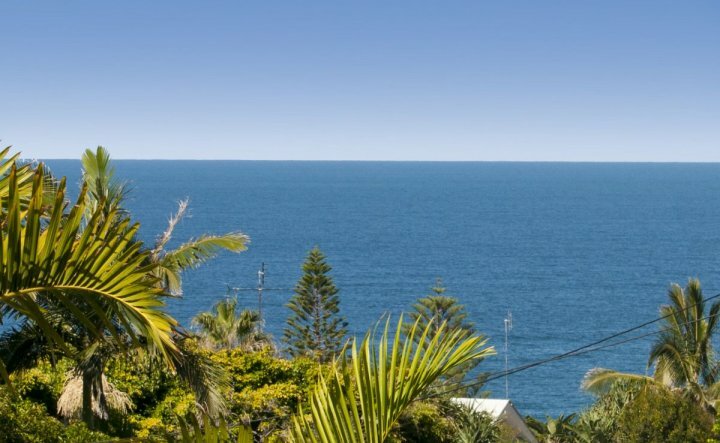 Situated over the Pool with Great Ocean Views. Star Rating 3 1/2 Star Apartment. 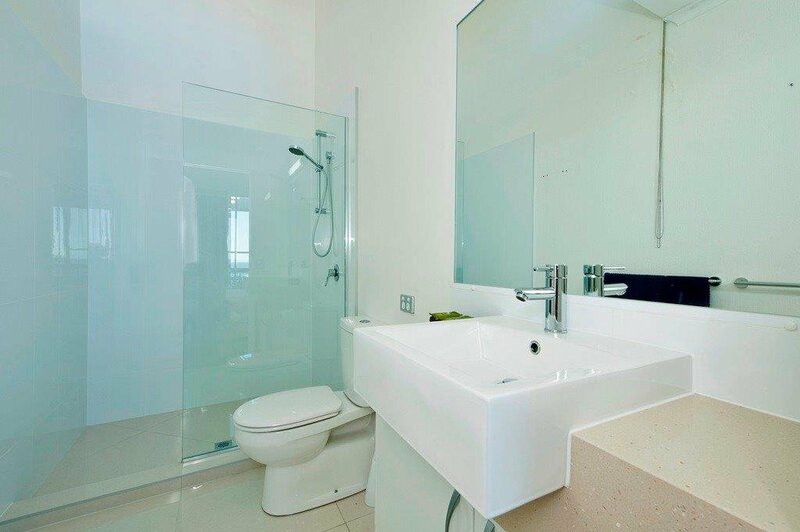 We do not decrease the Tariff for our 3 1/2 Star Apartments as they are very well maintained and beautifully presented. The bathrooms and the kitchen older style. 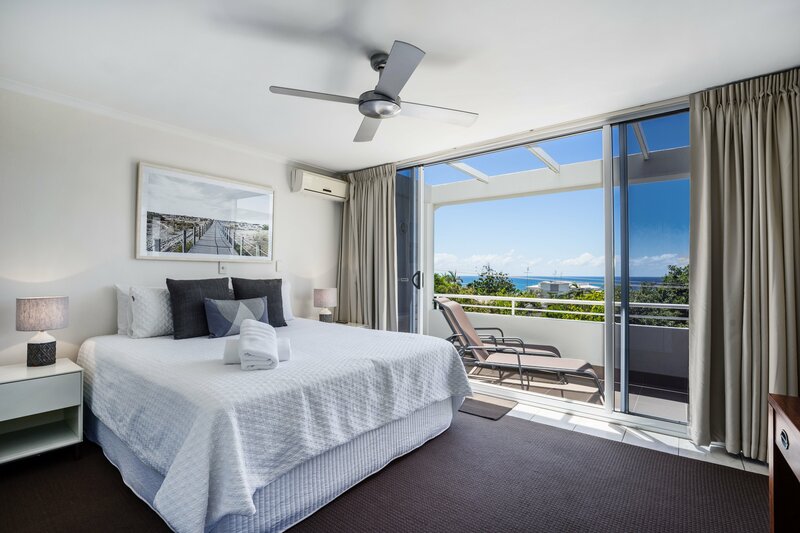 Level One Ocean View over the Pool - Full glass sliding doors open onto extra large private east facing balcony from living room and Main bedroom. Main bedroom Ultra Super King bed with en-suite, 2nd Bedroom 2 x Single Beds. 2 Bathrooms. Flat Screen smart TV Living room, DVD player, Free Foxtel TV. Free Unlimited WI-FI. Direct dial telephone, Full linen provided. Reverse cycle air conditioning in living room and Master Bedroom only and ceiling fans throughout. Outdoor Setting including sun lounges. Important Notes Older Style bathrooms and kitchen - Smoking Inside. Note - Walk up access only NO LIFT. No Parties. No Functions. Max. 4 Guests. Apartment 4 modern Living/Dining Furniture in Light Wood Grain. Ultra Super King Bed and 2 x Flat Screen TV's. 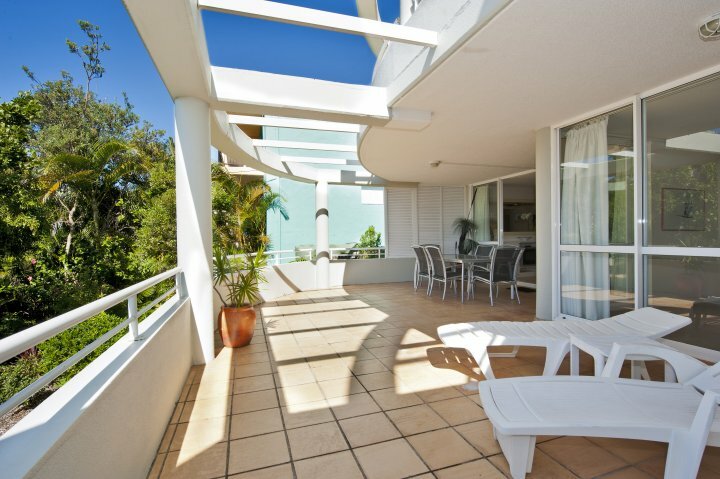 Situated over the Pool with Great Ocean Views. Star Rating 3 1/2 Star Apartment. Special Note for Star Ratings Please note we do not decrease the Tariff for our 3 1/2 Star Apartments as they are very well maintained and beautifully presented. 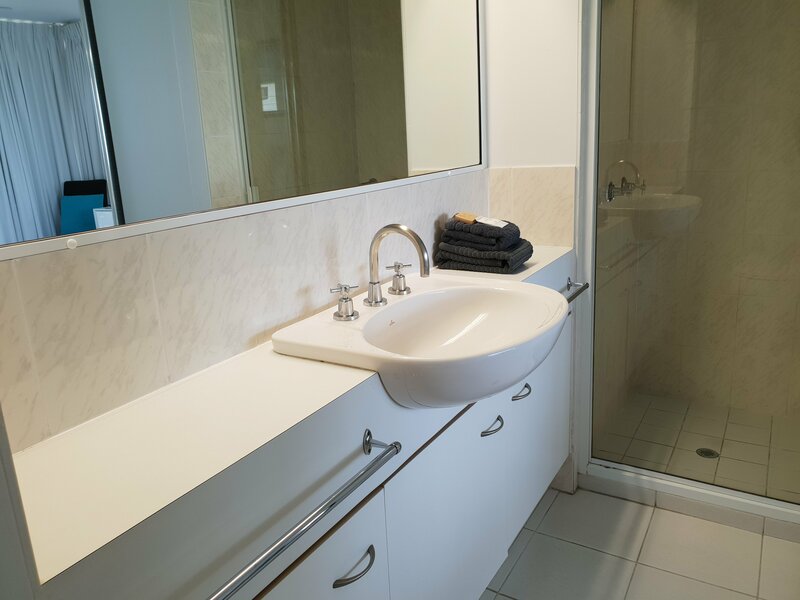 The bathrooms and the kitchen are well presented and are the older style. 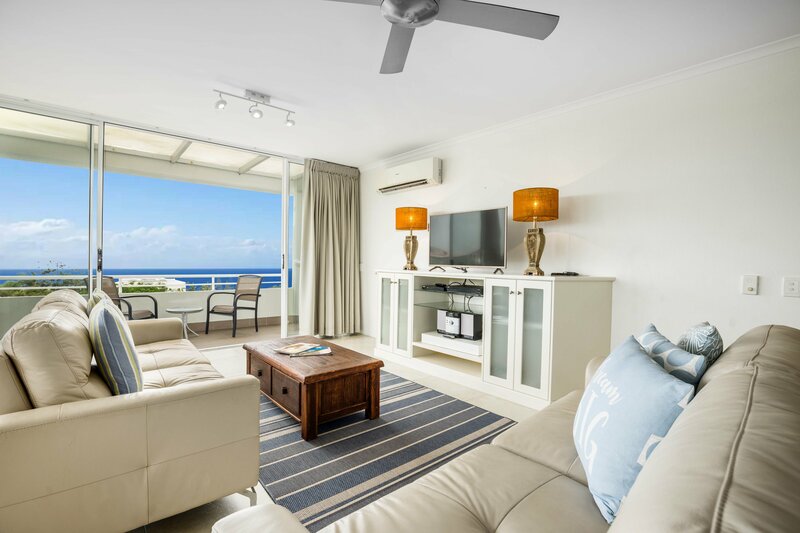 Level One Ocean View over the Pool - Full glass sliding doors open onto extra large private east facing balcony from living room and Main bedroom. Main bedroom Ultra Super King bed with en-suite, 2nd Bedroom 2 x Single Beds. 2 Bathrooms. Flat Screen smart TV, DVD player, Free Foxtel TV. Free Unlimited WI-FI. Direct dial telephone, Full linen provided. Reverse cycle air conditioning in living room and Master Bedroom only and ceiling fans throughout. Outdoor Setting including sun lounges. Important Notes Older Style bathrooms and kitchen - Smoking Inside. Note - Walk up access only NO LIFT. No Parties. No Functions. Max. 4 Guests. Apartment 4 modern Living/Dining Furniture in Light Wood Grain. Ultra Super King Bed and 2 x Flat Screen TV's. 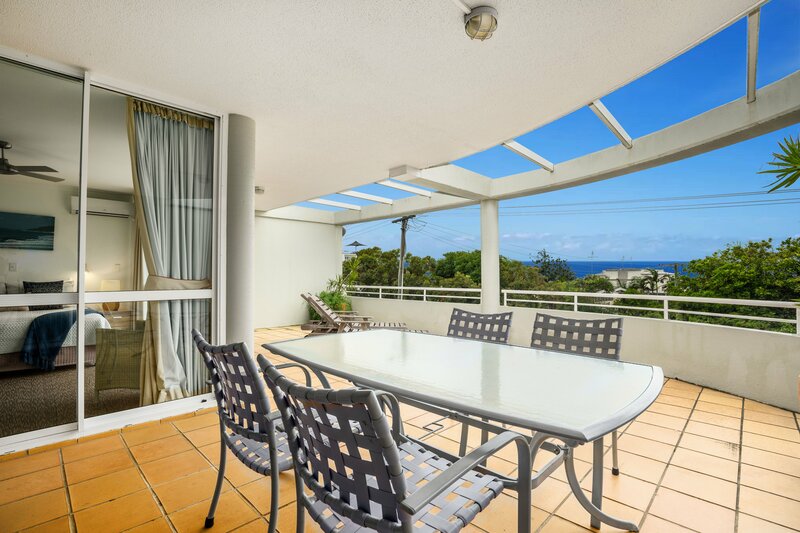 Situated over the Pool with Great Ocean Views. Star Rating 3 1/2 Star Apartment. 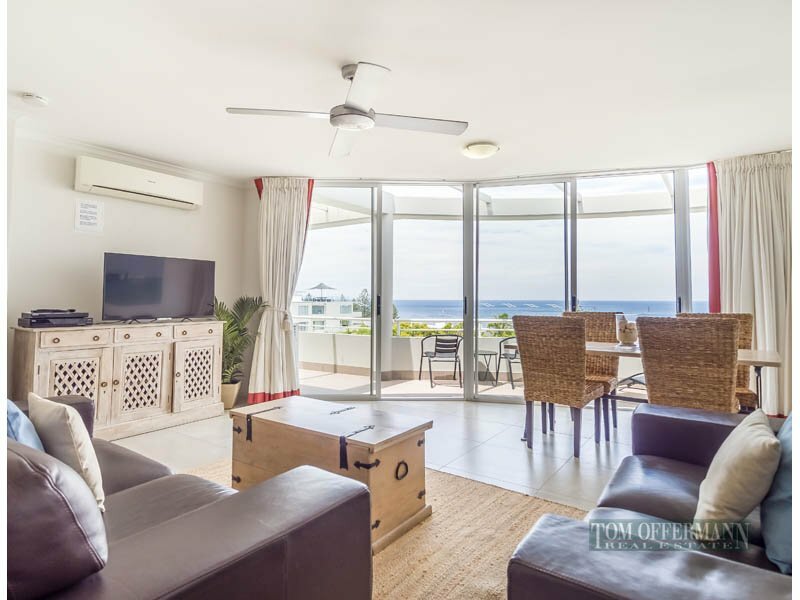 Special Note for Star Ratings Please note we do not decrease the Tariff for our 3 1/2 Star Apartments as they are very well maintained and beautifully presented. 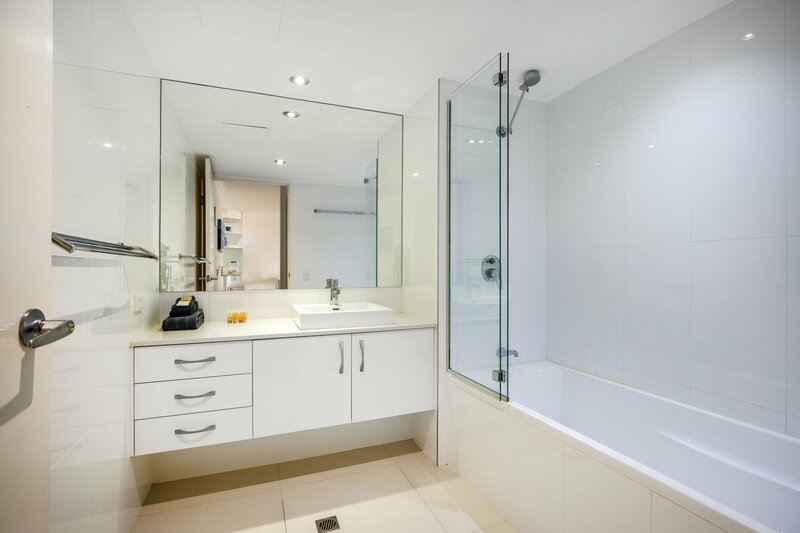 The bathrooms and the kitchen are well presented and are the older style. Level 2. 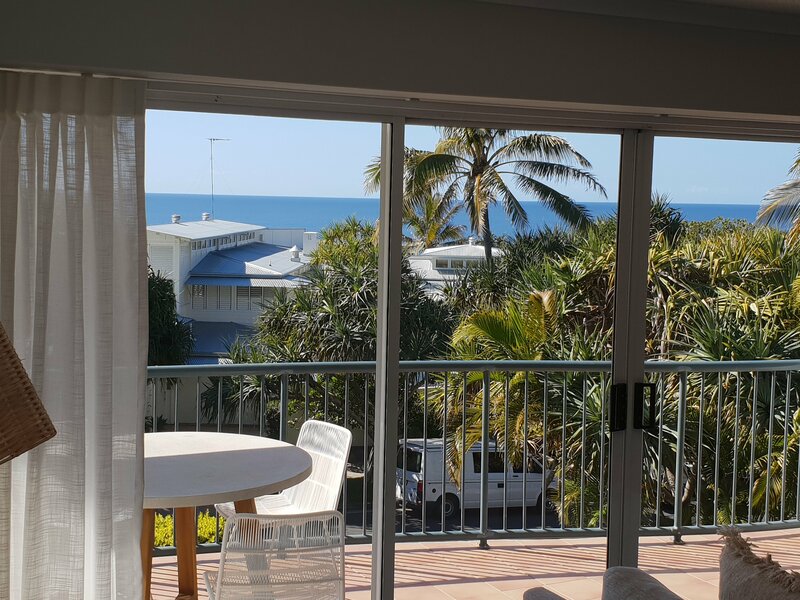 Full glass sliding doors open onto private east facing balcony to capture wide ocean views from living room and main bedroom. Main bedroom King Bed with en-suite, Flat Screen TV, DVD player. Free Foxtel. FREE WI-FI. Direct dial telephone, Full linen provided. 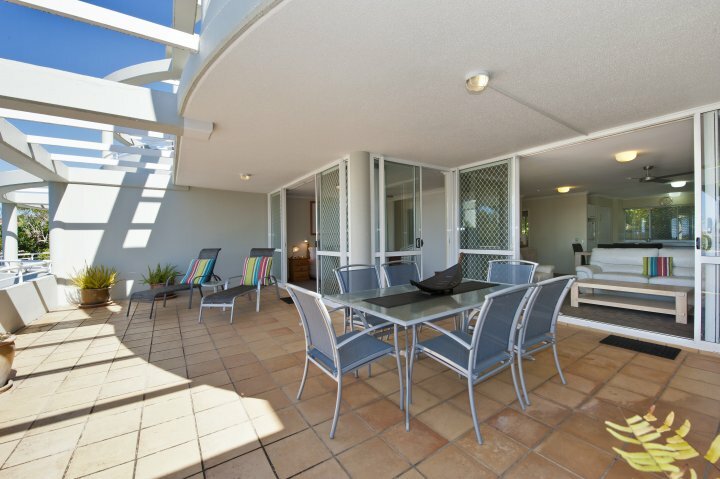 Reverse cycle air con + ceiling fans, Outdoor Furnishings including sun lounges. No Smoking Inside. Note - NO LIFT. No Parties. No Functions. Max. 2 Guests. Top Level Middle - Full glass sliding doors open onto private east facing balcony to capture panoramic views from living room and main bedroom. 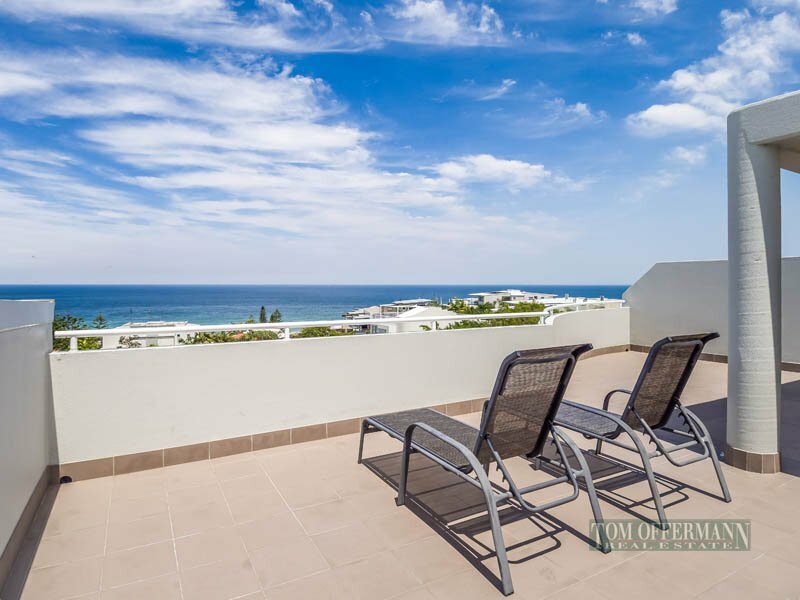 Panoramic Ocean Views from Private Rooftop Terrace. 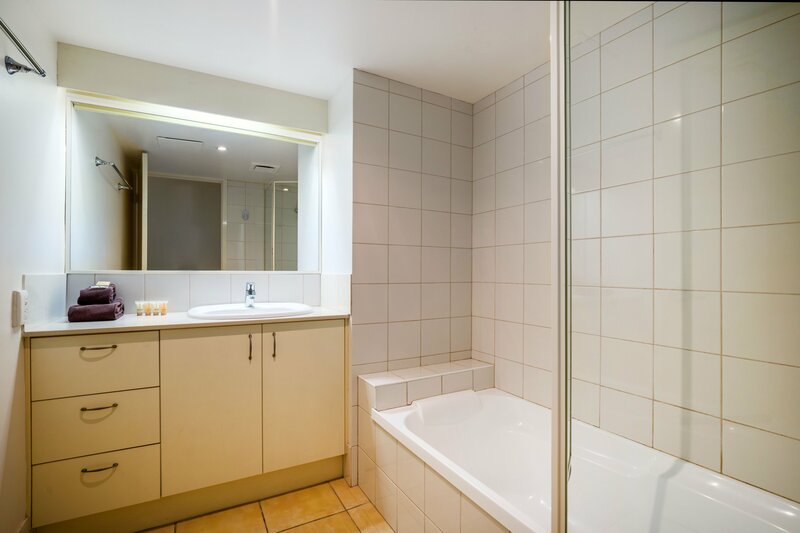 Main bedroom King bed with en-suite, 2 x Flat Screen TV's, DVD player, Free Foxtel and Free Wi-fi. Direct dial telephone, Full linen provided. 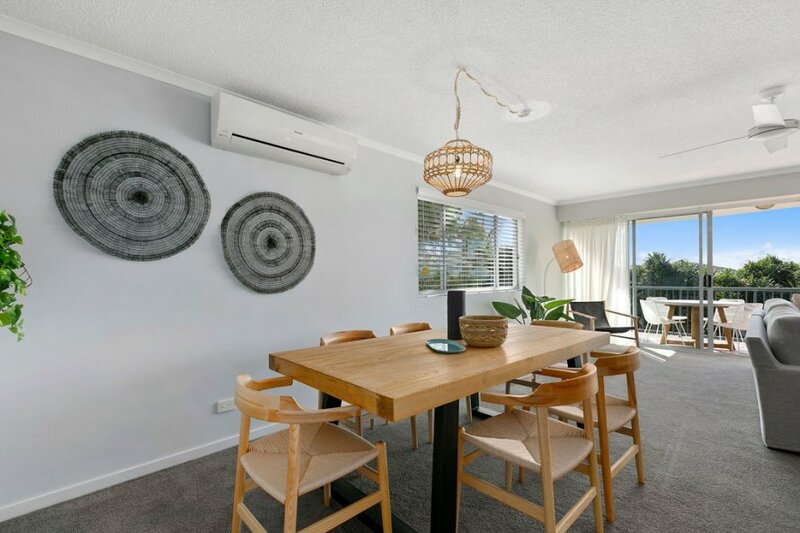 Reverse cycle air con + ceiling fans, Outdoor Furnishings including sun lounges. No Smoking Inside. Note - NO LIFT. No Parties. No Functions. Max. 2 Guests. EXTRA GUESTS Extra Child Permitted Only up to 2 Years Old $40 per night charged. Port-a-cot available on request only. Top Level Middle - Full glass sliding doors open onto private east facing balcony to capture panoramic views from living room and main bedroom. 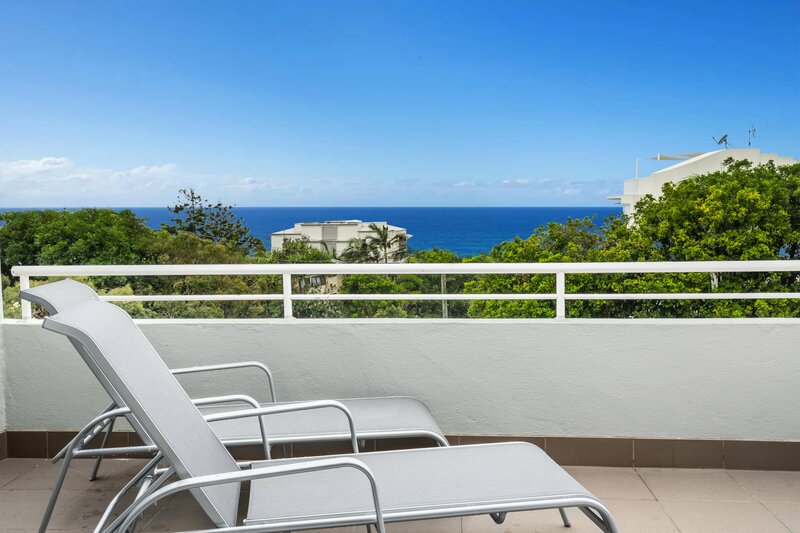 Panoramic Ocean Views from Private Rooftop Terrace. 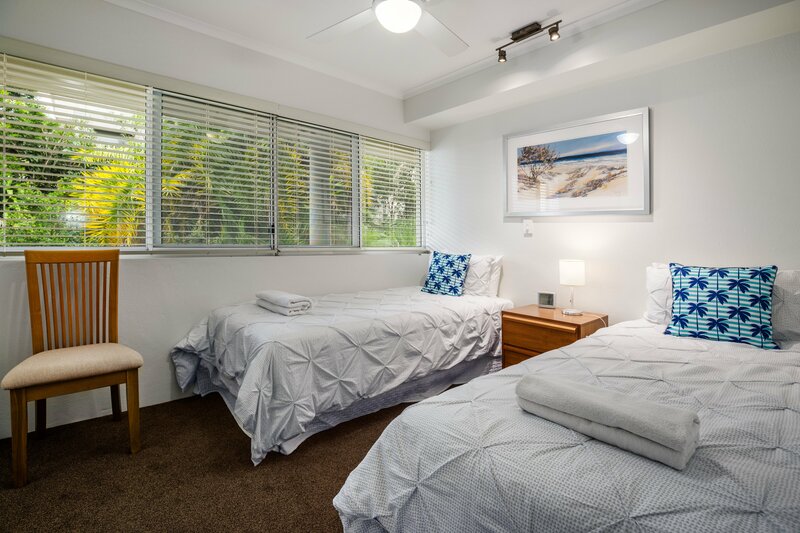 Master bedroom King bed with en-suite, 2 x Flat Screen TV's, DVD player, Free Foxtel and Free Wi-fi. Direct dial telephone, Full linen provided. 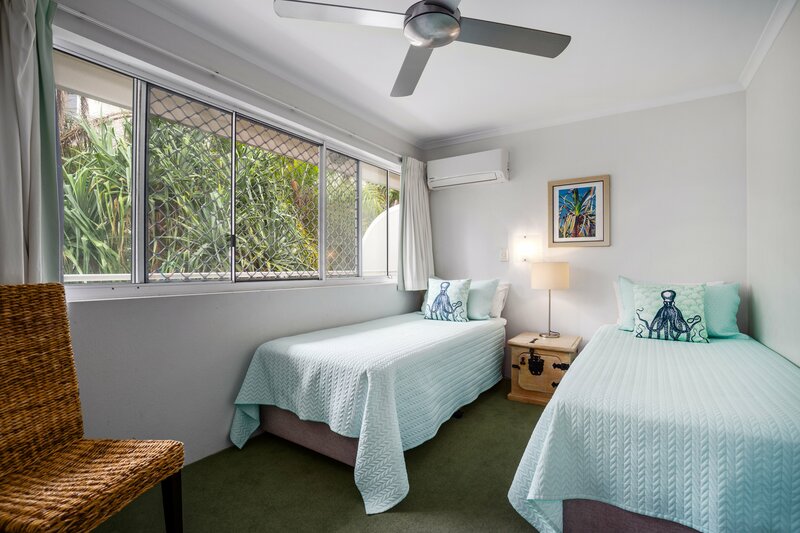 Reverse cycle air con + ceiling fans, Outdoor Furnishings including sun lounges. No Smoking Inside. Note - NO LIFT. No Parties. No Functions. Max. 2 Guests. EXTRA GUESTS Extra Child Permitted Only up to 2 Years Old $40 per night charged. Port-a-cot available on request only. Top Level Middle. 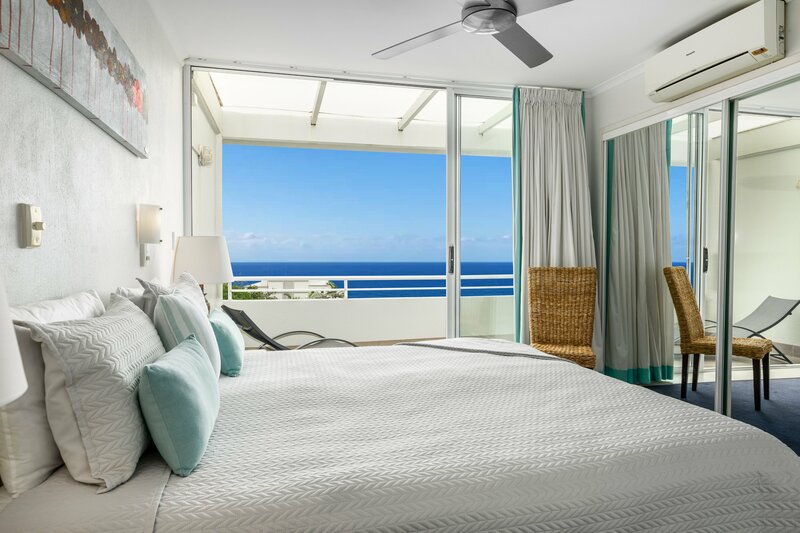 Full glass sliding doors open onto private east facing balcony to capture panoramic ocean views from living room and main bedroom. 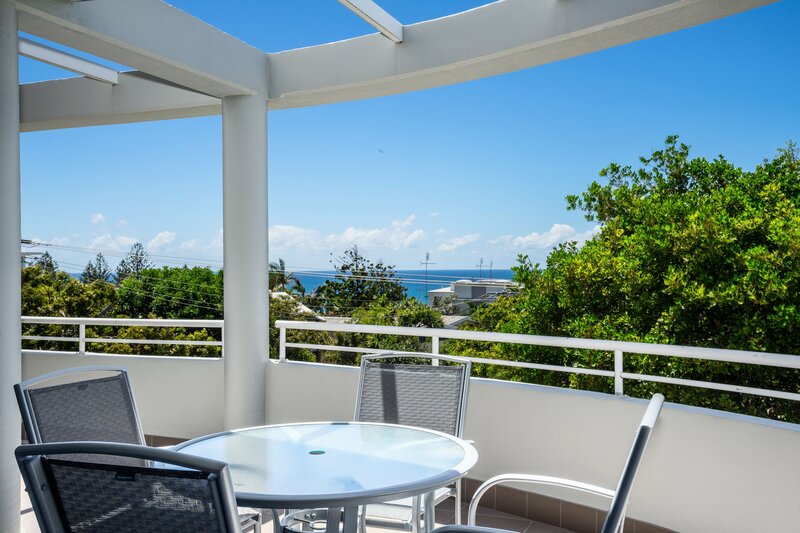 Panoramic Ocean Views from Private Rooftop Terrace. Main bedroom King bed with en-suite. 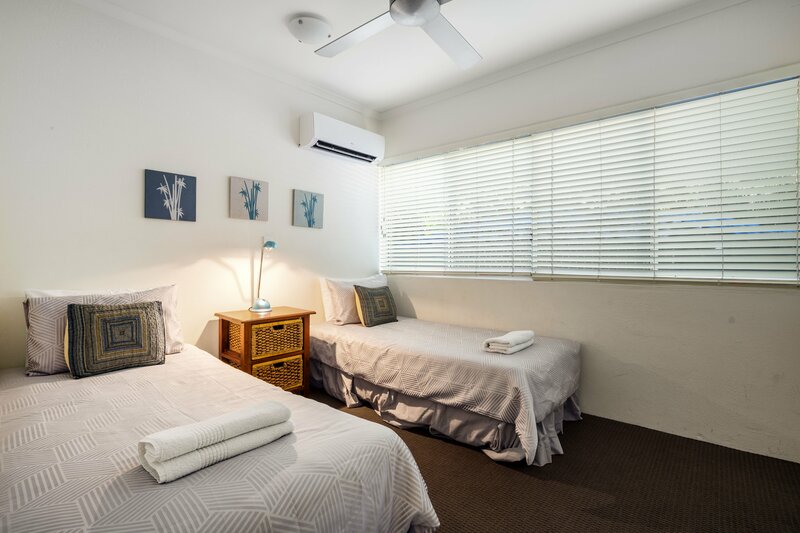 2 x Flat Screen TV's, DVD player, Free Foxtel and Free Wifi, Direct dial telephone, Full linen provided. 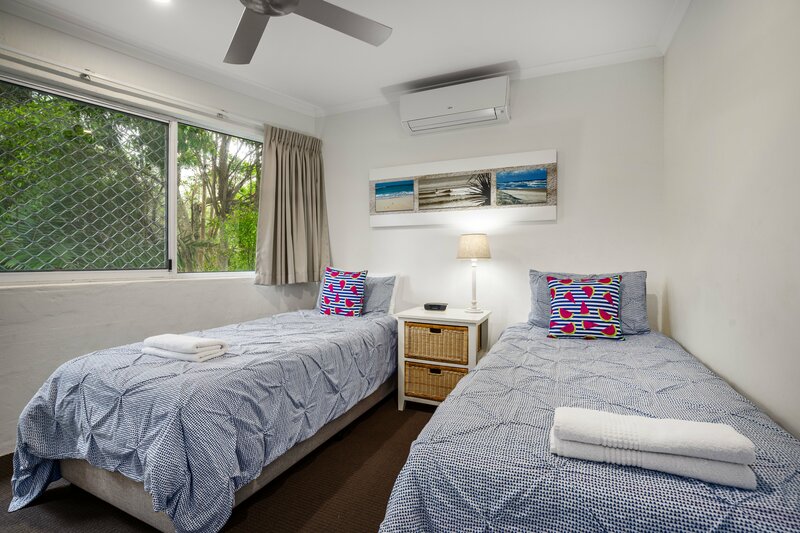 Reverse cycle air con + ceiling fans, Outdoor Furnishings including sun lounges. No Smoking Inside. Note - No lift. No Parties. No Functions. Max. 2 Guests. EXTRA GUESTS Extra Child Permitted Only up to 2 Years Old $40 per night charged. Port-a-cot available on request only. 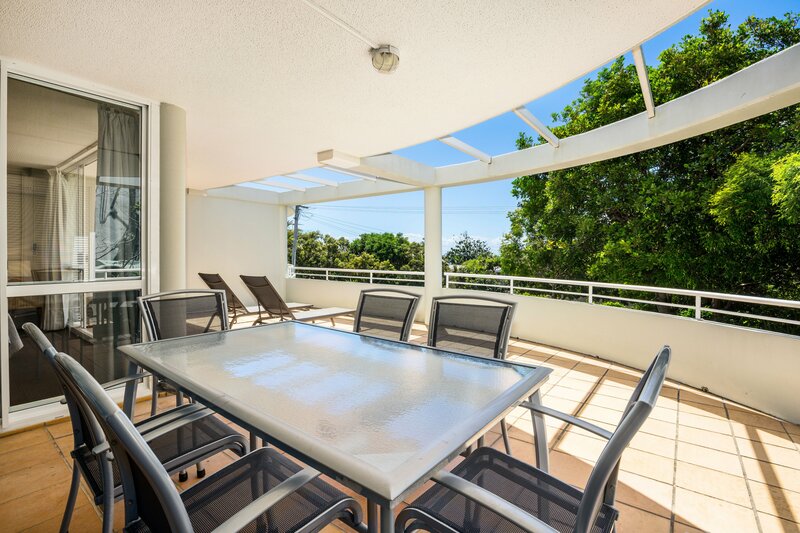 Top Level Middle - Full glass sliding doors open onto private east facing balcony to capture panoramic views from living room and Main bedroom. 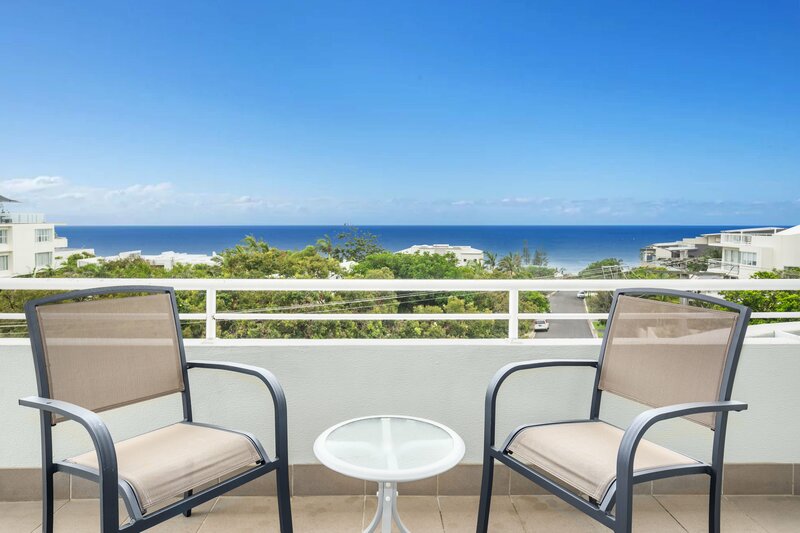 Panoramic Ocean Views from Private Rooftop Terrace. 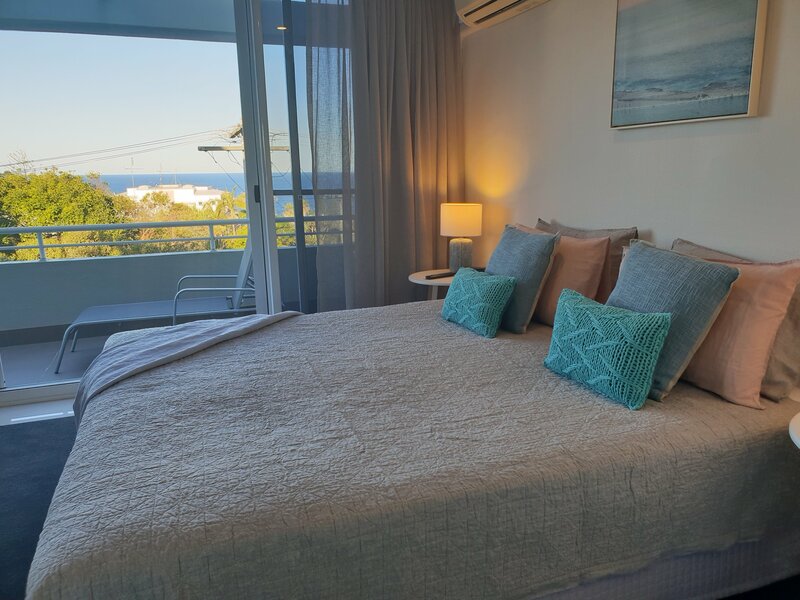 Main bedroom has a King bed with en-suite, Second bedroom single beds(Queen on Request) with rear garden views, Second bathroom with Laundry.. 2 x Flat Screen TV's, DVD player, Free Foxtel and Free Wi-fi. Direct dial telephone, Full linen provided. Air conditioned in every room. 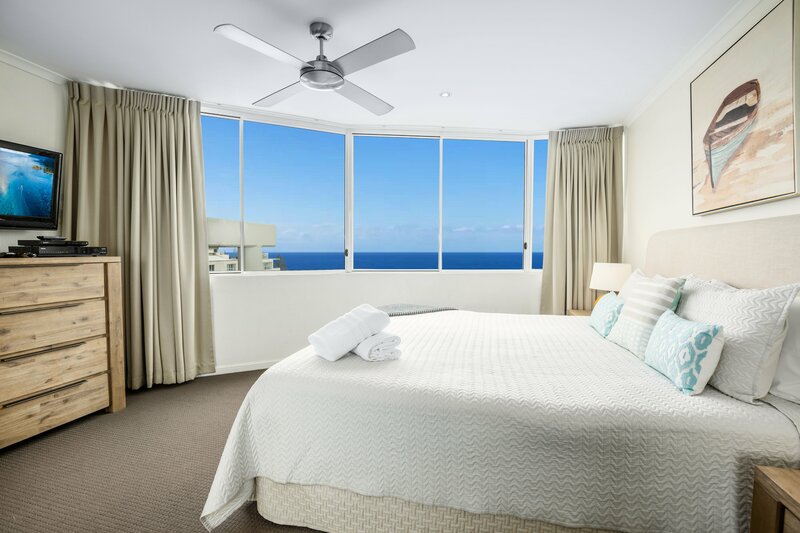 ceiling fans, Outdoor Furnishings including sun lounges. No Smoking Inside. Note - NO LIFT. No Parties. No Functions. Max. 4 Guests. EXTRA GUESTS Extra Child Permitted Only up to 2 Years Old $40 per night charged. Port-a-cot available on request only. 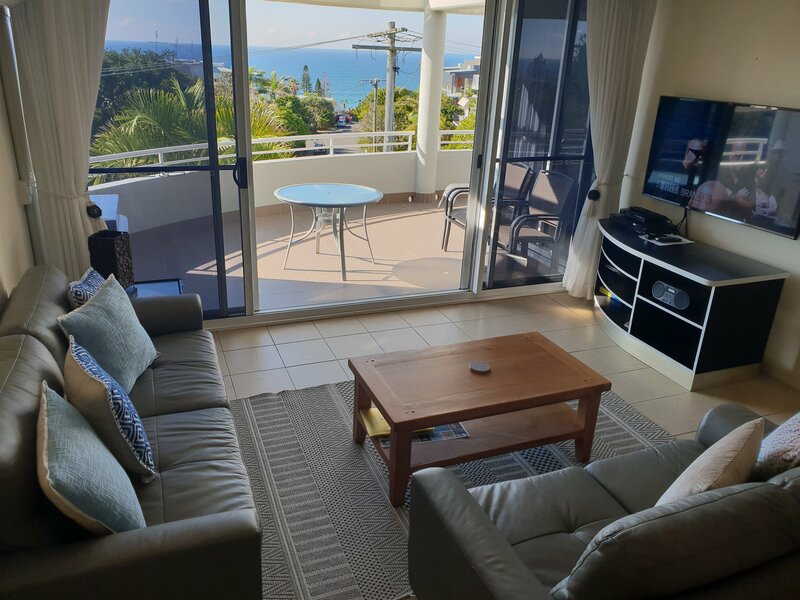 Top Level Middle Three Bedrooms Maximum 6 Guests.. Full glass sliding doors open onto private east facing balcony to capture panoramic ocean views from living room and main bedroom. Private Roof-top Terrace with Panoramic Ocean Views. Main bedroom King bed with en-suite and Ocean View. Second Bedroom Queen, Third bedroom 2 x Singles. The 2nd and 3rd Bedrooms have Garden Views. Second bathroom and Laundry. 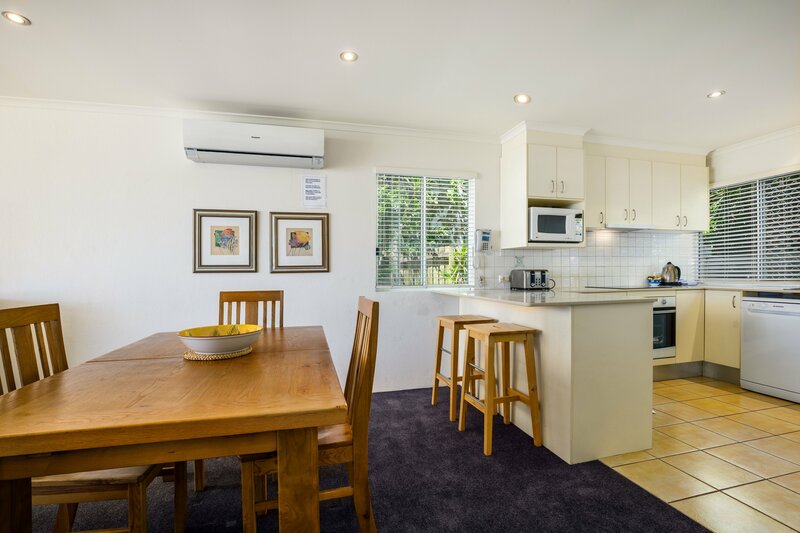 2 x Flat Screen TV's, DVD player, Free Foxtel and Free Wi-fi, Direct dial telephone, Full linen provided. Air conditioned in every room. 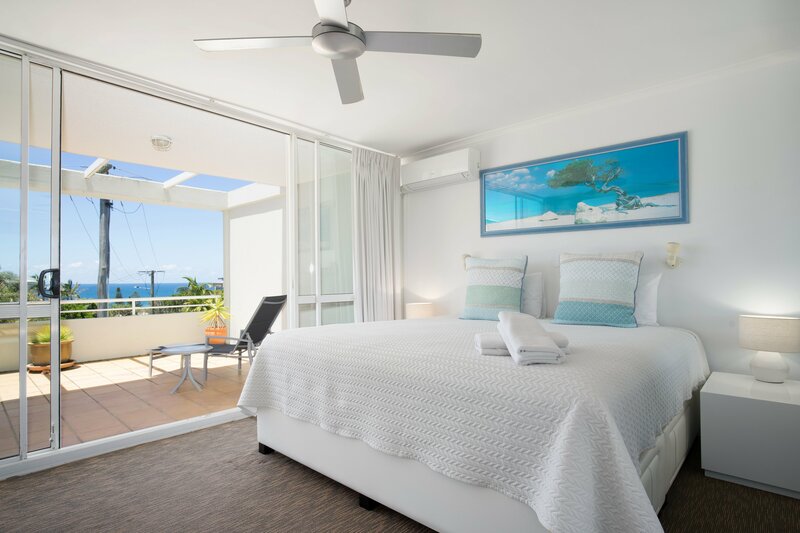 ceiling fans, Outdoor Furnishings including sun lounges. No Smoking Inside. Note - NO LIFT. No Parties. No Functions. Extra Large Living/Dining/Kitchen. 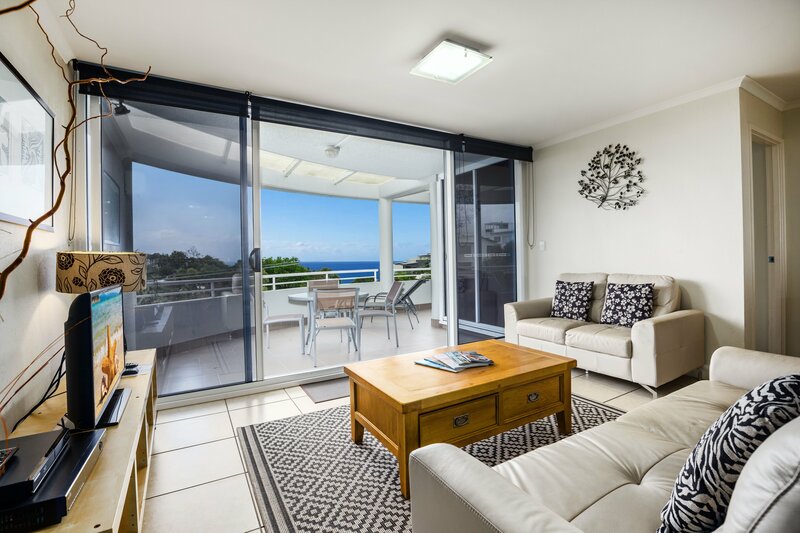 Full glass sliding doors open onto private east facing balcony to capture panoramic ocean views from living room. Private Roof-top Terrace with Panoramic Ocean Views. 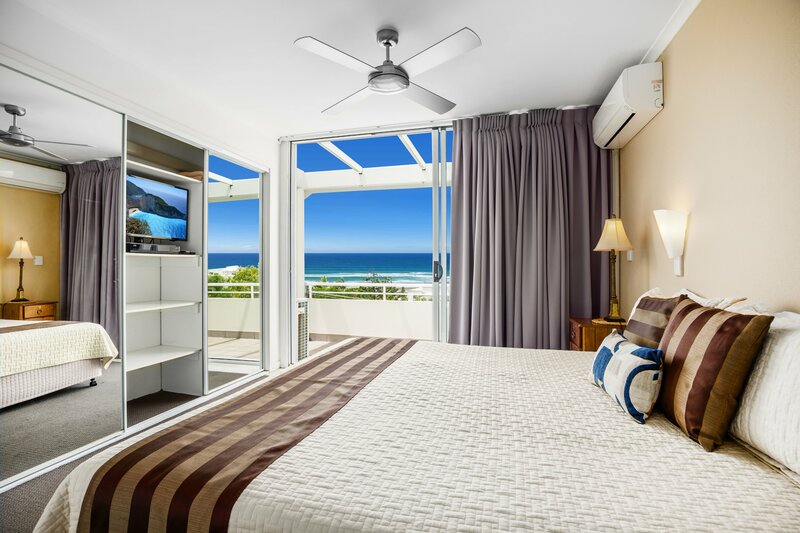 Main bedroom Ocean View, King bed with en-suite, Each apartment has 2 x Flat Screen TV's, DVD player, Free Foxtel and Free UNLIMITED Wi-fi Internet Access. Direct dial telephone, Full linen provided. 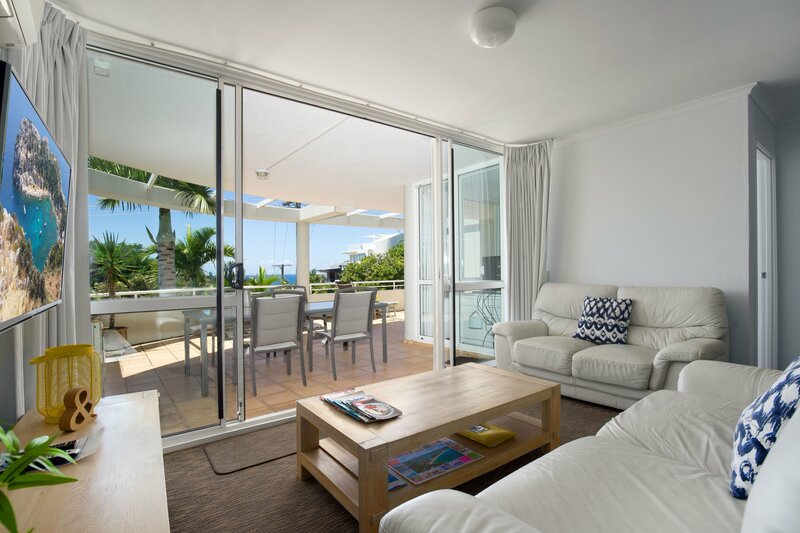 Reverse cycle air con + ceiling fans throughout, Outdoor Furnishings including sun lounges. No Smoking Inside. Note -NO LIFT Stair access or footpath access reduces to 2 1/2 flights of Stairs. No Parties. No Functions. Max.2 Guests. EXTRA GUESTS Extra Child Permitted Only up to 2 Years Old $40 per night charged. Port-a-cot available on request only. Apartment 11 or Apartment 14. Car Park x 1. Extra Large Living/Dining/Kitchen. 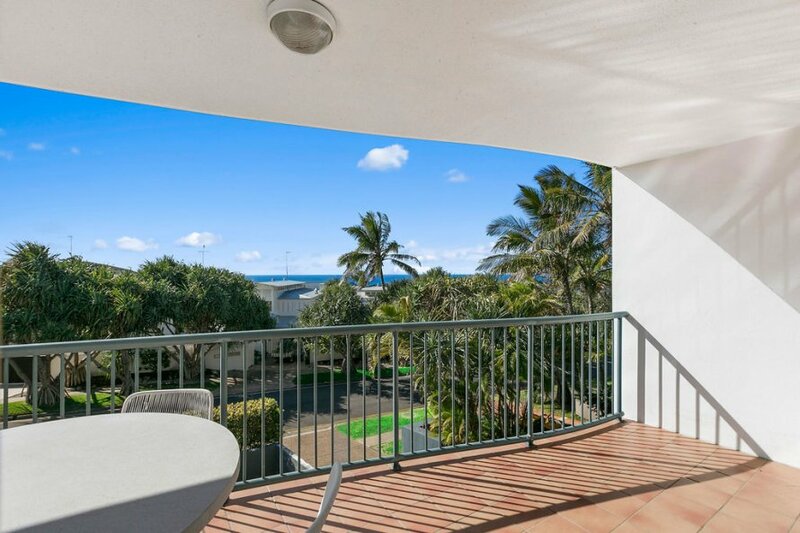 Full glass sliding doors open onto private east facing balcony to capture panoramic ocean views from living room. Private Roof-top Terrace with Panoramic Ocean Views. 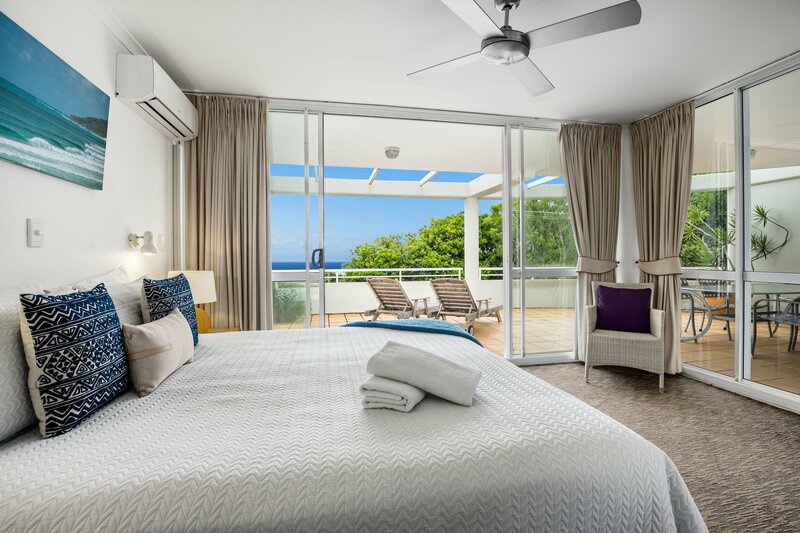 Main bedroom Ocean View, King bed with en-suite, Second bedroom YOUR CHOICE 2 single beds or Queen Bed. Second bathroom and separate toilet. 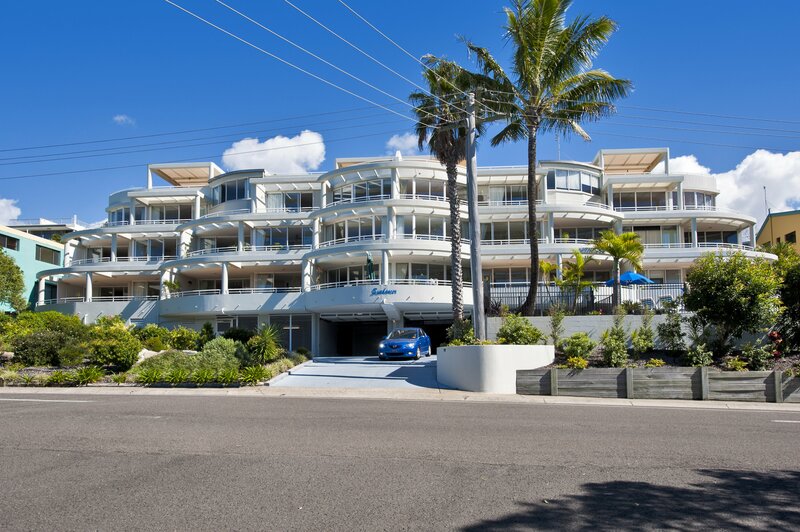 Each apartment has 2 x Flat Screen TV's, DVD player, Free Foxtel and Free UNLIMITED Wi-fi Internet Access. Direct dial telephone, Full linen provided. 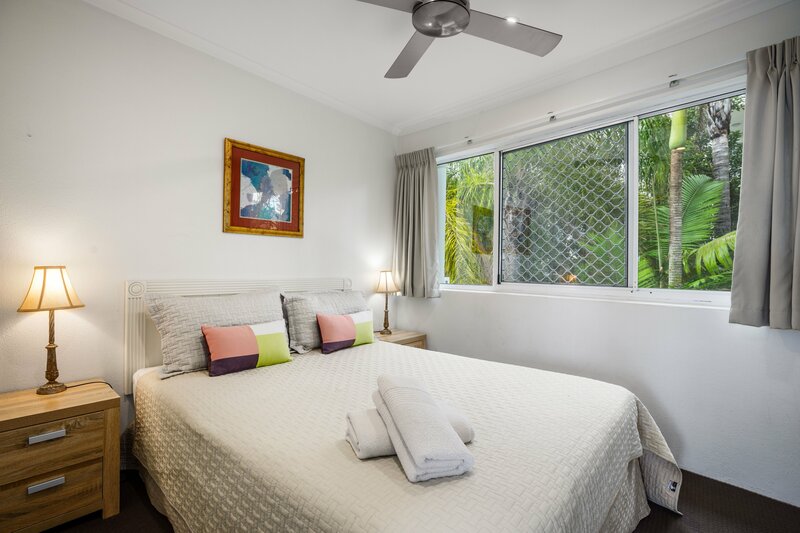 Reverse cycle air con + ceiling fans, Outdoor Furnishings including sun lounges. No Smoking Inside. Note -NO LIFT Stair access or use the footpath access which reduces the stairs to 2 1/2 flights. No Parties. No Functions. Max. 4 Guests. EXTRA GUESTS Extra Child Permitted Only up to 2 Years Old $40 per night charged. Port-a-cot available on request only. Apartment 11 or Apartment 14. Both apartments air conditioned in all rooms. Apartment Both Apartments Car Parks x 2. Extra Large Living/Dining/Kitchen. 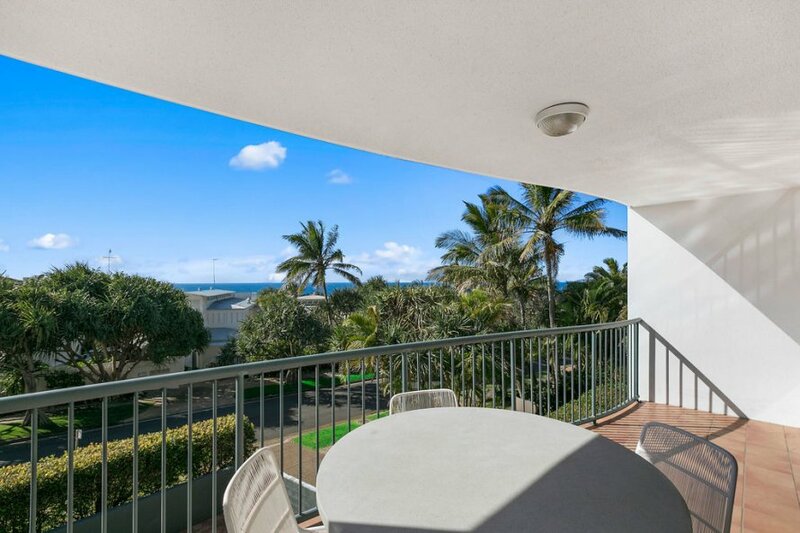 Full glass sliding doors open onto private east facing balcony to capture panoramic ocean views from living room. Private Roof-top Terrace with Panoramic Ocean Views. 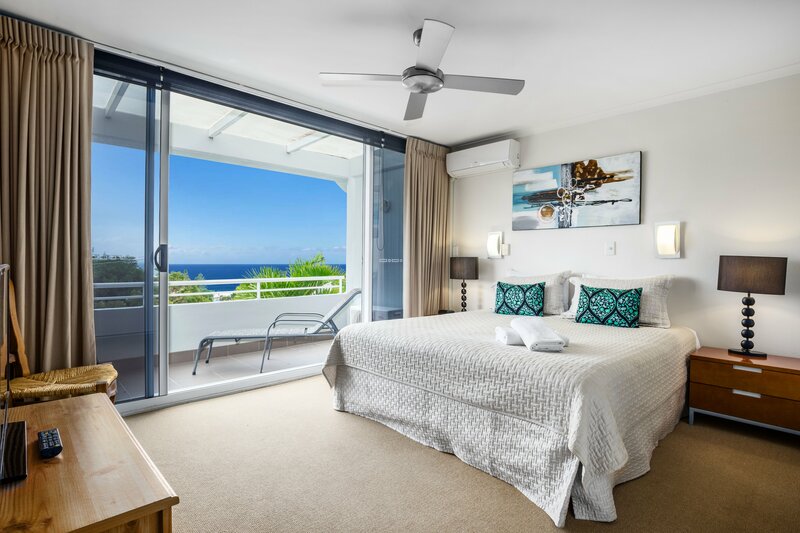 Main bedroom Ocean View, King bed with en-suite, Second bedroom YOUR CHOICE 2 single beds or Queen Bed. 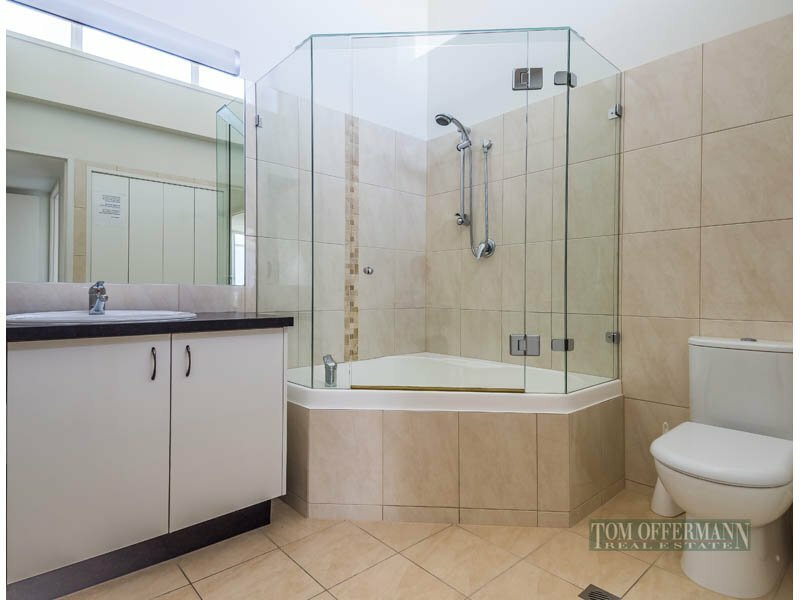 Second bathroom and separate toilet. 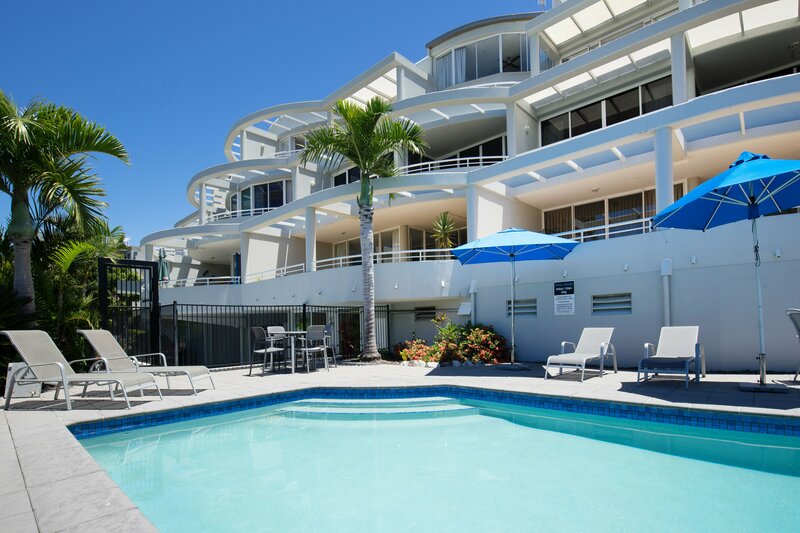 Each apartment has 2 x Flat Screen TV's, DVD player, Foxtel 50 channels and Free UNLIMITED Wi-fi Internet Access. Direct dial telephone, Full linen provided. 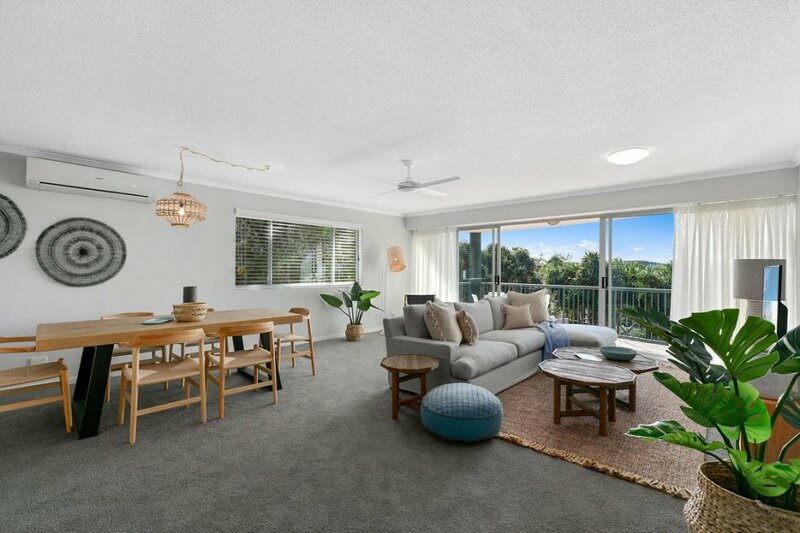 Reverse cycle air con + ceiling fans, Outdoor Furnishings including sun lounges. No Smoking Inside. NO LIFT Stair access or use the footpath access which reduces the stairs to 2 1/2 flights. No Parties. No Functions. Max. 4 Guests. Apartment 11 or Apartment 14. 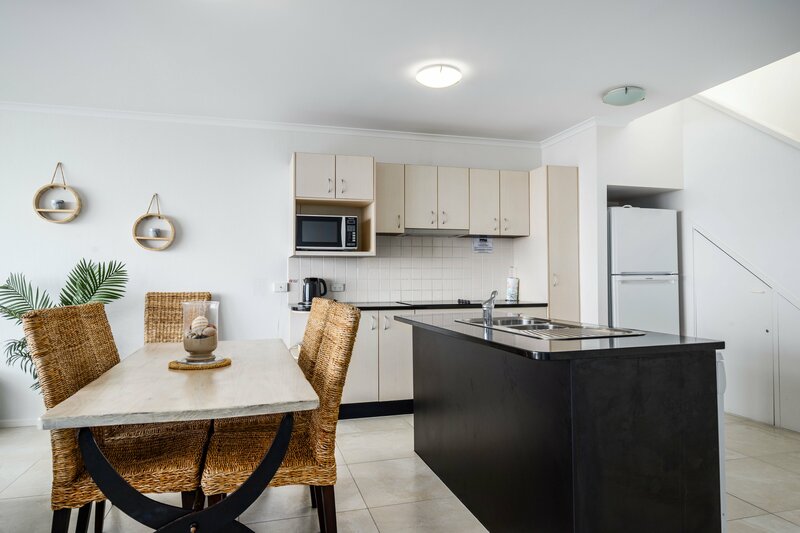 Extra Information Apartment 11 or Apartment 14 - Both apartments air conditioned in all rooms. Both Apartments Car Parks x 2. Extra Large Living/Dining/Kitchen. 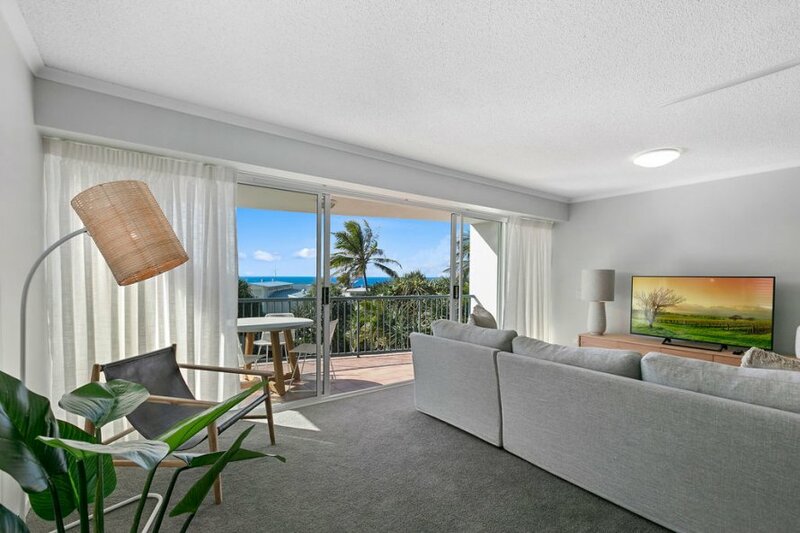 Full glass sliding doors open onto private east facing balcony to capture panoramic ocean views from living room. Private Roof-top Terrace with Panoramic Ocean Views. 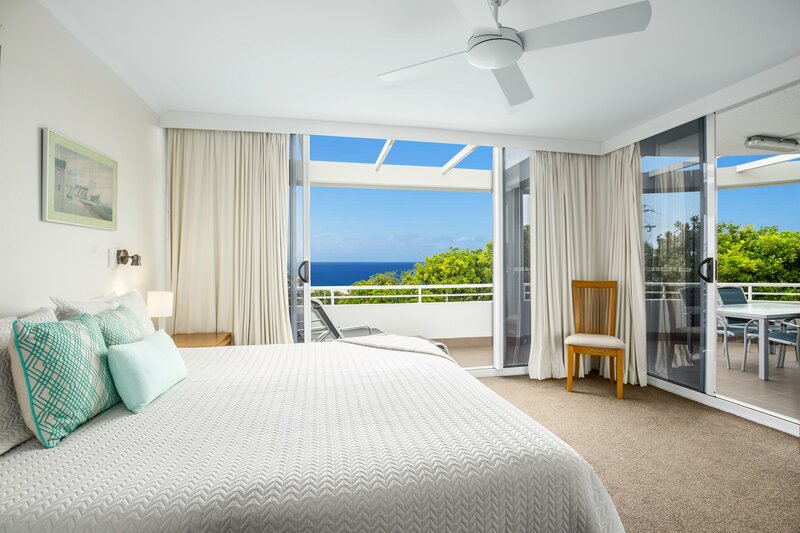 Main bedroom Ocean View, King bed with en-suite, Second bedroom YOUR CHOICE 2 single beds or Queen Bed. Second bathroom and separate toilet. 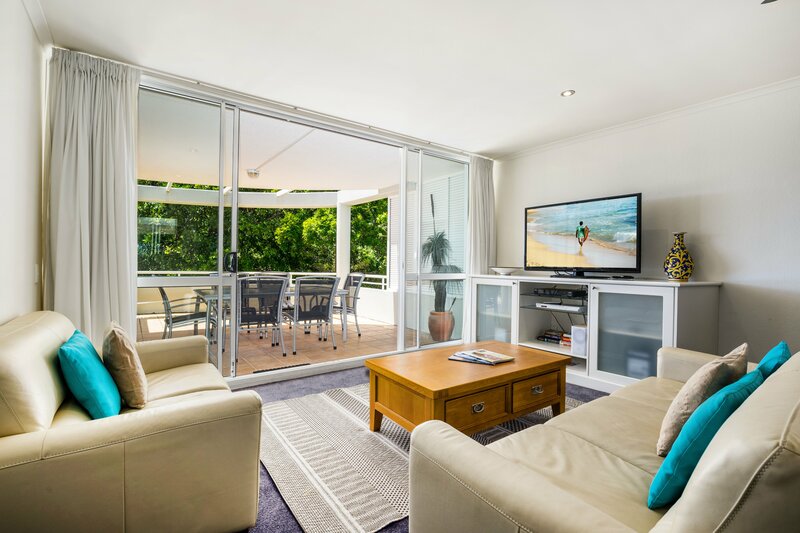 Each apartment has 2 x Flat Screen TV's, DVD player, Free Foxtel and Free Wi-fi Internet Access. Direct dial telephone, Full linen provided. 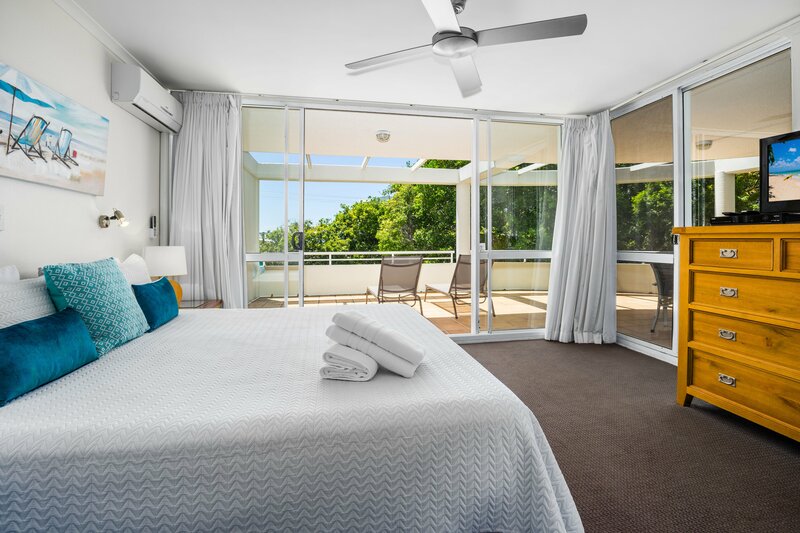 Reverse cycle air con + ceiling fans, Outdoor Furnishings including sun lounges. No Smoking Inside. Note -NO LIFT Stair access or use the footpath access which reduces the stairs to 2 1/2 flights. No Parties. No Functions. Max. 4 Guests. Apartment 11 or Apartment 14. 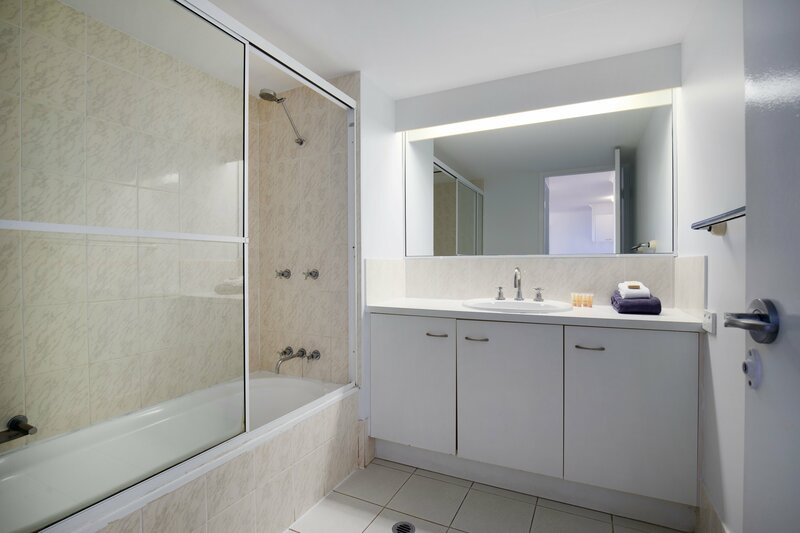 Extra Information Apartment 11 or Apartment 14 - Both apartments air conditioned in all rooms. Both Apartments Car Parks x 2. Three Bedrooms Maximum 6 Guests. Full glass sliding doors open onto private east facing balcony to capture panoramic ocean views from living room and main bedroom. Private Roof-top Terrace with Panoramic Ocean Views. Main bedroom King bed with en-suite, Second bedroom 2 single beds, 3rd Bedroom Queen Bed. 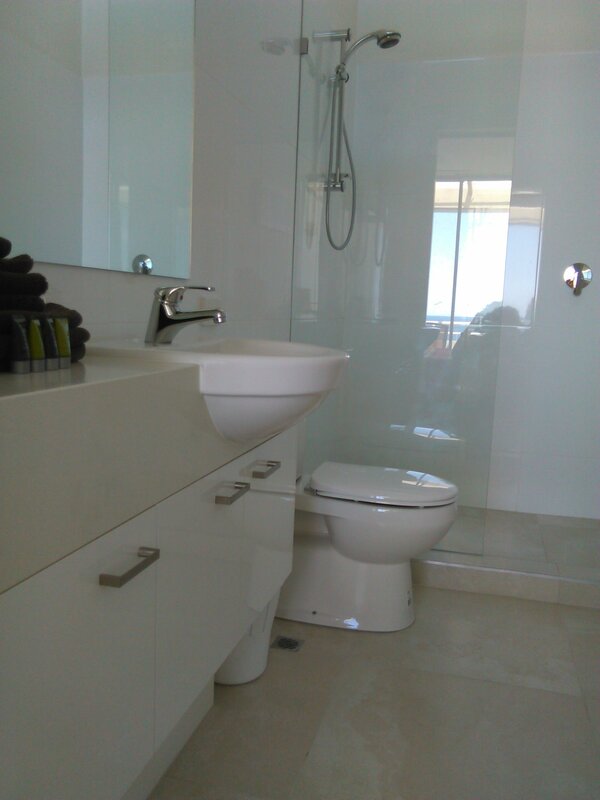 Second bathroom and separate toilet. 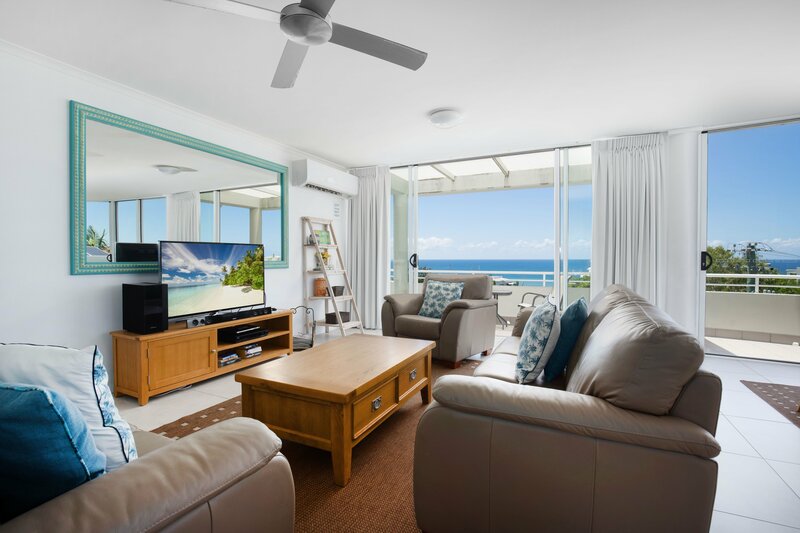 2 x Flat Screen TV's , DVD player, Free Foxtel and Free UNLIMITED Wi-fi, Direct dial telephone, Full linen provided. 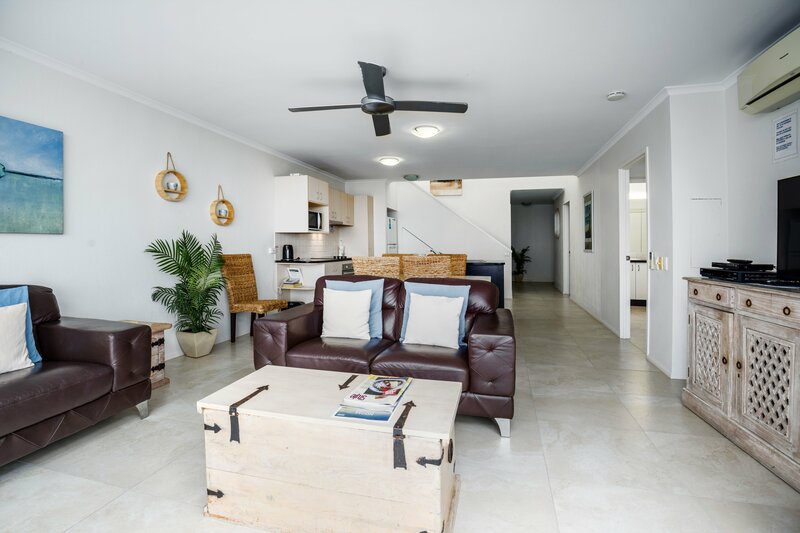 Reverse cycle air con + ceiling fans, Outdoor Furnishings including sun lounges. No Smoking Inside. Note - NO LIFT Stair access or use the footpath access which reduces the stairs to 2 1/2 flights. No Parties. No Functions. 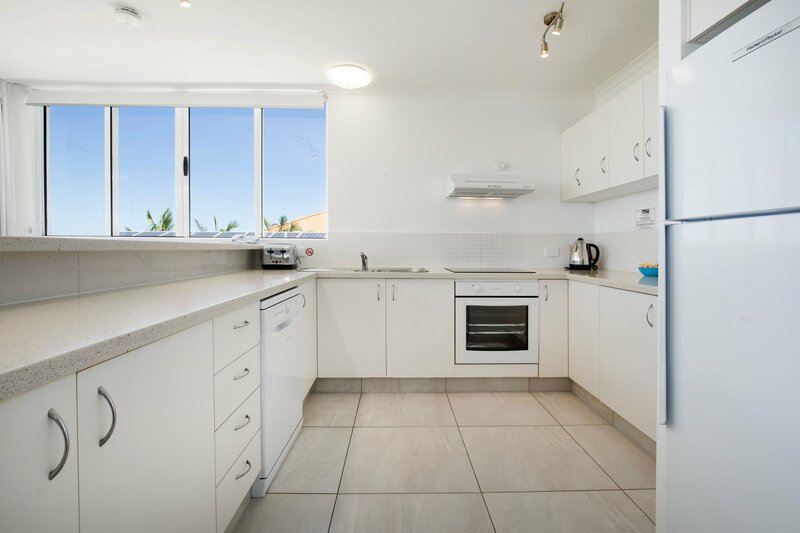 Extra Information Apartment 11 or Apartment 14 - Both apartments air conditioned in all rooms. Apartment 11 - 3rd bedroom can be converted to King Bed if required cost $35. Car Parks x 2. Free Wi-Fi Internet Access (Unlimited access). Fax, Scan, and Photocopy Services. Charges Apply - Ask Reception. Check In From 2pm - 4.30pm Monday to Thursday. Friday 2pm - 4pm. PLEASE READ Weekend arrivals welcome - Saturday and Sunday Office Closed. Mid-Seasons and Peak Seasons Check-in from 3pm only. *Early Arrivals Welcome Park your car in visitors and stroll to the beach until your apartment is ready. ****Please contact us 48 hours prior to arrival to arrange after hours or weekend self check-in. 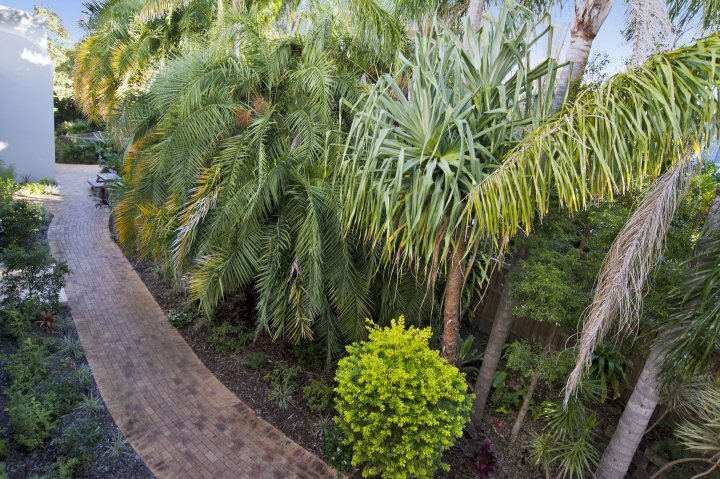 Phone Reception Free Call 1800 2 444 62 or International 0061 7 5449 2007 prior to your arrival to obtain access to your keys. We do not permit extra guests in our apartments - charges will be processed to your credit card if you breach our conditions of occupancy. Free Secure Basement Car parking. One Car Space for Level 1 and 2 Apartments and Two Car Spaces for Top Level Apartments. Brisbane airport is the International and Domestic Gateway to south-east Queensland. The Sunshine Coast Airport at Maroochydore also accommodates regular jet services from Sydney and Melbourne, with connections from other capital cities, now including Auckland New Zealand. Airport Shuttle run from the airports to Sunshine Beach. Henry's Shuttles or Con-X-ion Shuttles. From Brisbane airport it takes approx. 1.30 hours, whilst from the Sunshine Coast Airport it is approx. 30 mins. The Bruce Highway and Sunshine Motorway are the major roads servicing the Sunshine Coast region. 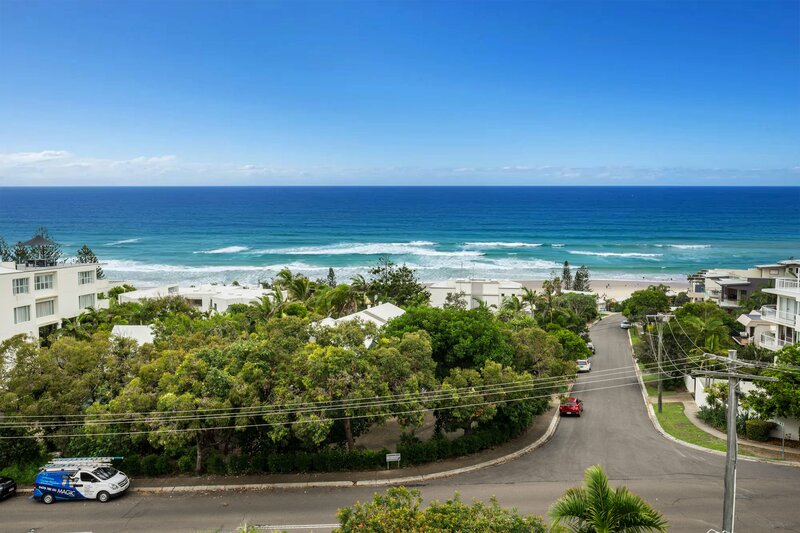 Traveling time from Brisbane to Sunshine Beach is 1 hour and 30 minutes. Sunshine Coast Airport Maroochydore travelling time to Sunshine Beach is 35 minutes. 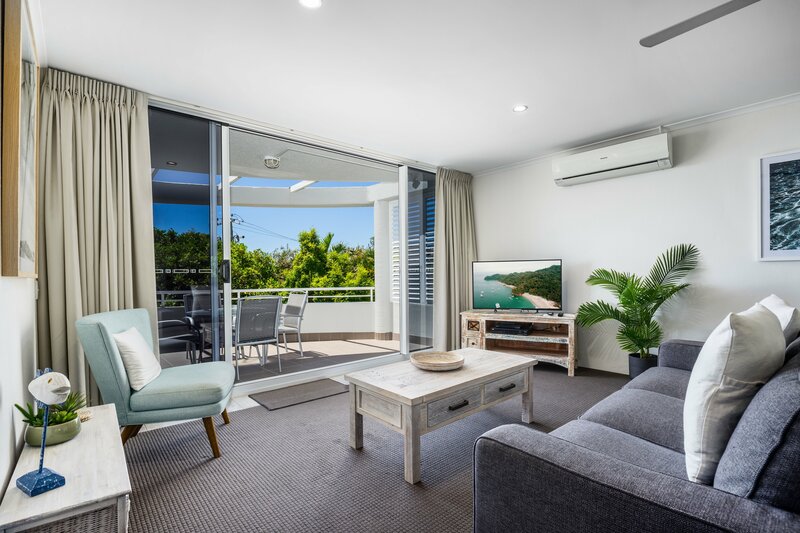 The unique laid-back village atmosphere of Noosa's Sunshine Beach makes it the perfect holiday destination for those looking for a short break to rest and revive, or for those taking a well deserved family holiday. Located at the northern end of 9 kms of pristine white sandy beaches, there is ample room to surf, swim or just sunbathe.. Walking tracks through Noosa's beautiful National Park are easily accessible from Sunshine Beach. Sensational restaurants and cafes are centrally located and cater to all tastes and budgets. Our local bakery, bottle shops, mini-mart, boutiques and hairdresser complete the picture. All this within walking distance from you resort and without the hassle of noisy crowds, traffic congestion or parking problems. The chic shopping and restaurants of Hastings Street is only a short 5 minute car trip away. 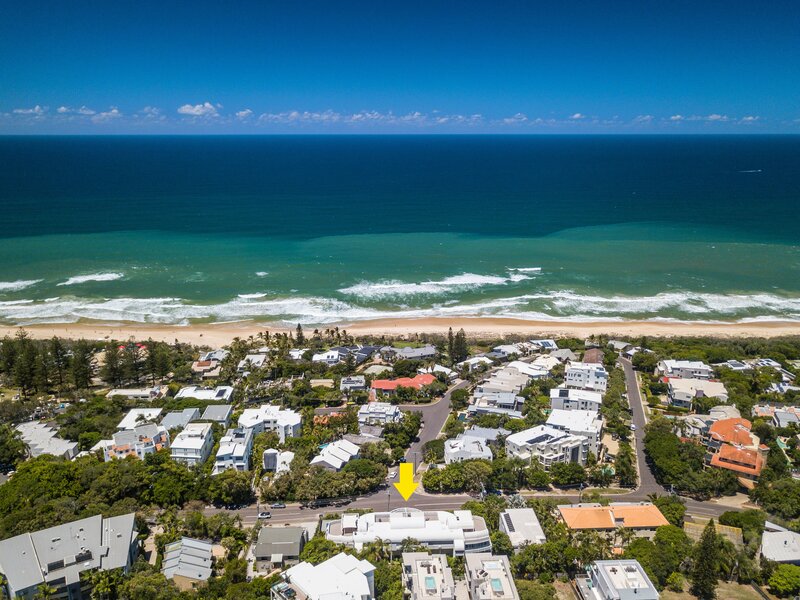 For those without transport, a regular bus service runs from Sunshine Beach to Noosa Junction and Hastings Street. 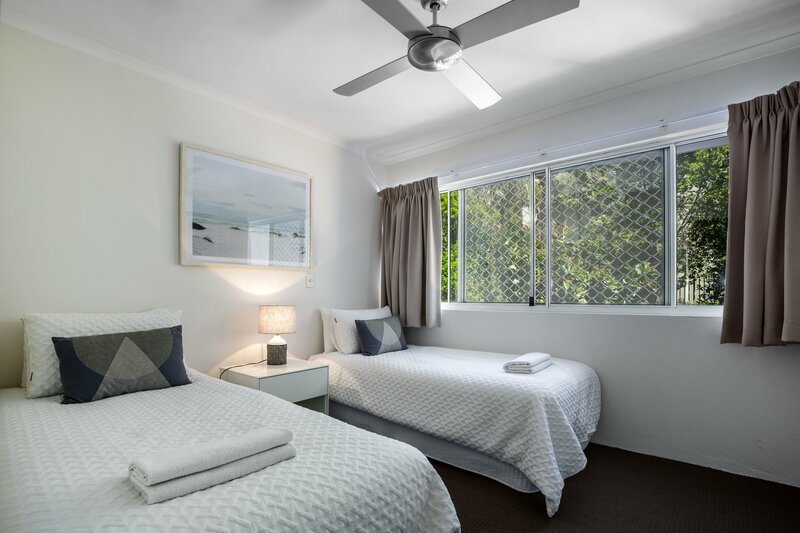 For those looking for a little more adventure, your accommodation hosts can provide information on a diverse range of activities such as paragliding, skydiving, windsurfing, tours to Fraser Island, Australian Zoo, Under Water World, Aussie World, Big Kart Track, The Big Pineapple, and the World Famous Eumundi Markets set on 3 acres and only 20 minutes drive North of Sunshine Beach.